As grandiose a notion as the title may imply, there have been some really promising and powerful moves made in the advancement of smoothly integrating real-time and/or streaming data technologies into most any enterprise reporting and analytics architecture. When used in tandem with functional programming languages like Python, we now have the ability to create enterprise grade data engineering scripts to handle the manipulation and flow of data, large or small, for final consumption in all manner of business applications. In this cavalcade of coding, we're going to use a combination of Satori, a free data streaming client, and python to stream live world cyber attack activity via an api. We'll consume the records as json, and then use a few choice python libraries to parse, normalize, and insert the records into a mysql database. 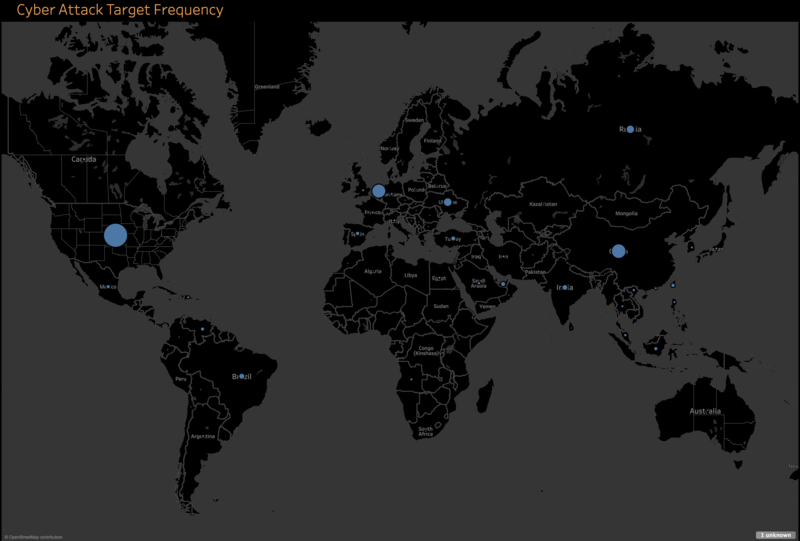 Finally, we'll hook it all up to Tableau and watch cyber attacks happen in real time with a really cool visualization. For the this exercise, we're going to bite things off a chunk at a time. We're going to utilize a service called Satori, a streaming data source aggregator that will make it easy for us to hook up to any number of streams to work with as we please. In this case, we'll be working with the Live Cyber Attack Threat Map data set. Next, we'll set up our producer code that will do a couple of things. First it will create the API client from which we will be ingesting a constant flow of cyber attack records. Next, we'll take these records and convert them to a data frame using the Pandas library for python. Finally, we will insert them into a MySQL database. 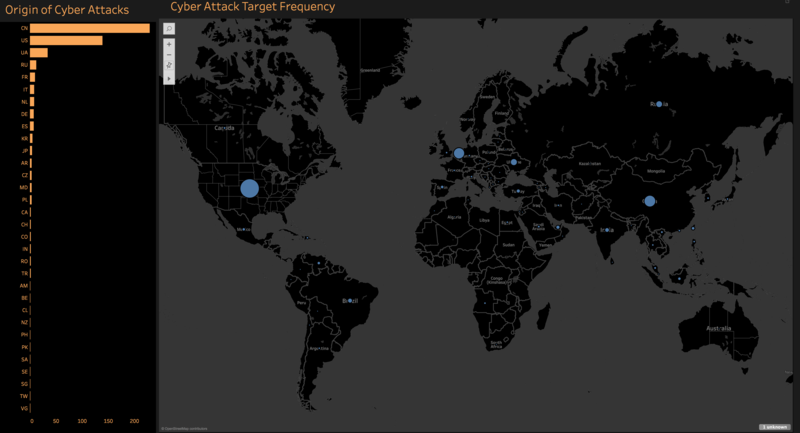 This will allow us to use this live feed as a source for Tableau in order to create a geo mapping of countries that are currently being targeted by cyber attacks. Satori is a new-ish service that aggregates the web's streaming data sources and provides developers with a client and some sample code that they can then use to set up their own live data streams. While your interests may lie in how you can stream your own company's data, it then simply becomes a matter of using python's requests library to get at whatever internal sources you might need. Find more on the requests library here. Satori has taken a lot of the guess work out of the first step of the process for us, as they provide basic code samples in a number of popular languages to access their streaming service and to generate records. You can find the link to this code in a number of popular languages here. Note that you'll need to install their client and get your own app key. I've added a bit of code at the end to handle the insertion of records, and to continue the flow, should any records produce a warning. Don't forget to sign in to your database to validate success! Now all we need to do is turn on the hose and watch our table fill up. Running producer.py, we can then open a new tab, log in to our database to make sure our table is being populated, and go to work. 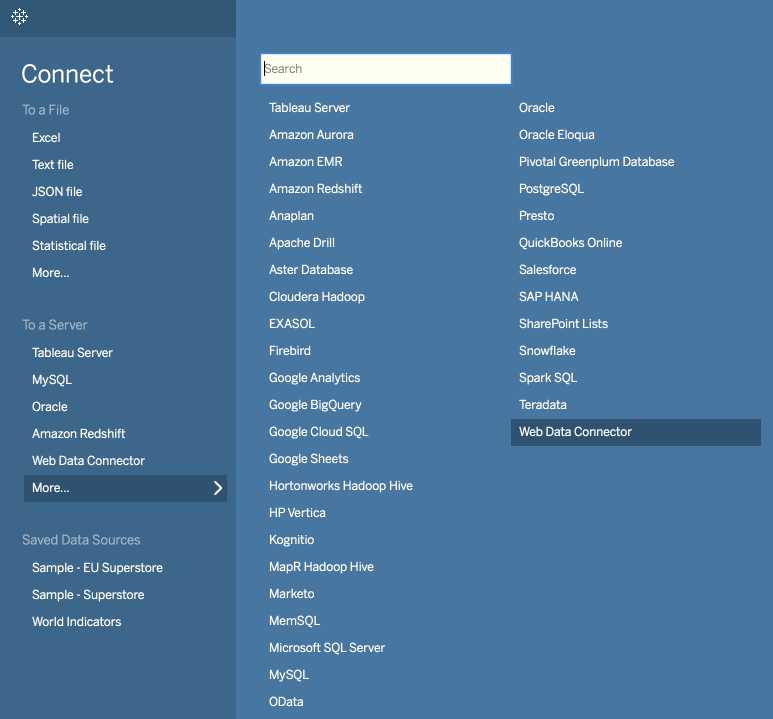 Create a new connection to your MySQL database (called my db 'hacks') in Tableau and verify that everything is in order once you navigate to the data preview. There are lots of nulls in this data set, but this will simply be a matter of filtering them out on the front end. Tableau should pick up right away on the geo data in the dataset, as denoted by the little globe icon next to the field. We can now simply double-click on the corresponding geo data field, in this case we'll be using Country Target, and then the Number of Records field in the Measures area. I've chosen to use the 'Dark' map theme for this example as it just really jives with the whole cyber attack, international espionage vibe. 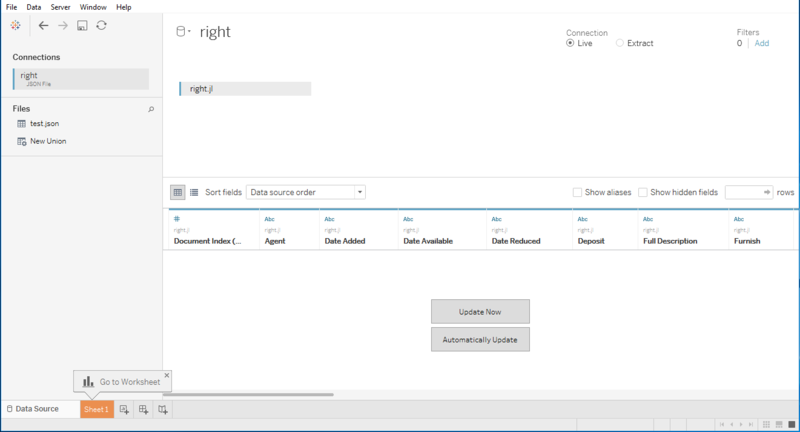 Note that you'll need to maintain a live connection, via Tableau, to your datasource and refresh at the interval you'd like, if using Tableau Desktop. If you're curious about how to automagically provide for this functionality, a quick google search will come up with some solutions. Time to Head Back to the Drawing Board? Since I started teaching OBIEE in 2011, I had the pleasure of meeting many fascinating people who work with Business Intelligence. Folks were heavy users of OBIEE, and just ready to take their skills to the next level. They were happily transitioning to OBIEE from a legacy reporting tool, that didn’t have the power that they needed. There were not-so-good times, like when people were being forced to transition to OBIEE. They felt that they were moving away from their comfort zone and diving into a world of complicated mappings that would first require them to become rocket scientists. They were resistant to change. I wanted to have a good answer to these questions. Over the years, different projects have allowed me the opportunity to work with diverse reporting tools. My students’ questions were always in mind: Why? And what are the benefits? So, I always took the time to compare/contrast the differences between OBIEE and these other tools. I noticed that many of them did a fantastic job at answering the questions needed, and so did OBIEE. It didn’t take me long to have the answer that I needed: the main difference in OBIEE is the RPD! The RPD is where so much Business Intelligence happens. There, developers spend mind boggling times connecting the data, deriving complex metrics and hierarchies, joining hundreds of tables, and making everything a beautiful drag and drop dream for report writers. Yes, many other tools will allow us to do magic with metadata, but most of them require this magic to be redefined every time we need a new report, or the report has a different criteria. Yes, the RPD requires a lot of work upfront, but that work is good for years to come. We never lose any of our previous work, we just enhance our model. Overtime, the RPD becomes a giant pool of knowledge for a company and is impressively saved as a file. For tapping into the RPD metadata, traditionally we have used BI Publisher and OBIEE. They are both very powerful and generally complement each other well. Other tools have become very popular in the past few years. Tableau is an example that quickly won the appreciation of the BI community and has kept consistent leadership in Gartner’s BI Magic quadrant since 2013. 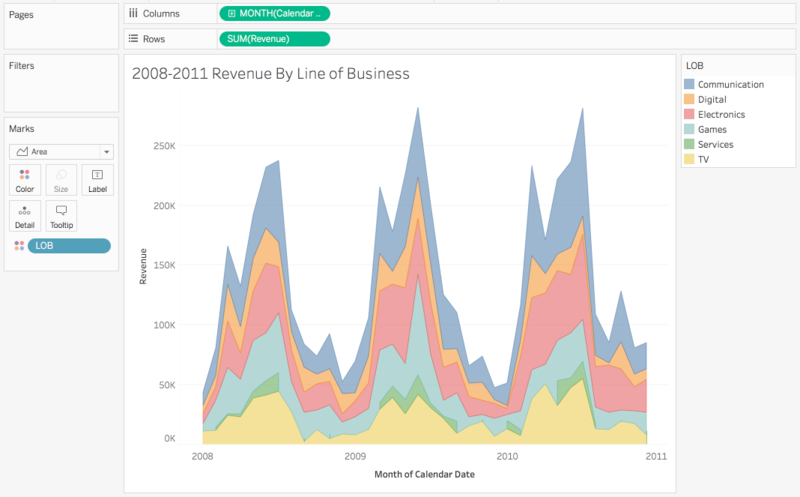 With a very slick interface and super fast reporting capability, Tableau introduced less complex methods to create amazing dashboards - and fast! So, what is there not to like? There is really so much TO like! Going back to the comparing and contrasting, the main thing that Tableau doesn’t offer is… the RPD. It lacks a repository with the ability to save the join definitions, calculations and the overall intelligence that can be used for all future reports. At Rittman Mead, we’ve been using these tools and appreciate their substantial capabilities, but we really missed the RPD as a data source. We wanted to come up with a solution that would allow our clients to take advantage of the many hours they had likely already put into metadata modeling by creating a seamless transition from OBIEE’s metadata layer to Tableau. 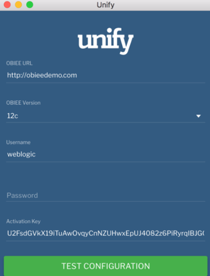 This past week, I was asked to test our new product, called Unify. Wow. Once again, I am so proud of my fellow coworkers. 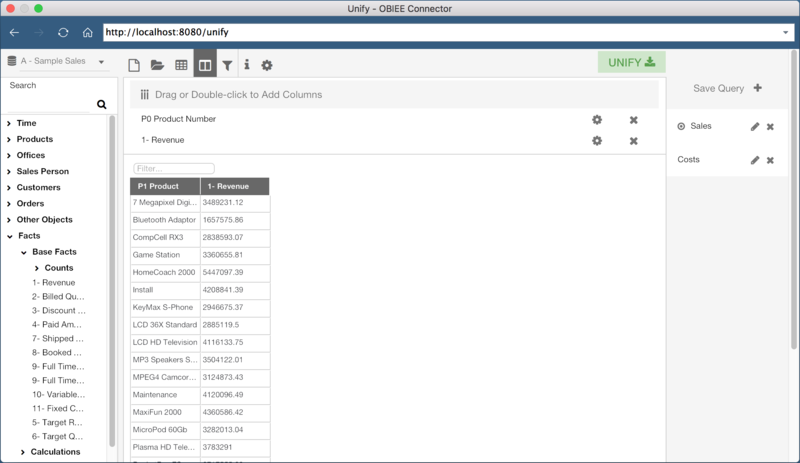 Unify has a simple interface and uses a Tableau web connector to create a direct line to your OBIEE repository for use in Tableau reports, stories and dashboards. We are immediately able to leverage all joins, calculated columns, hierarchies, RPD variables, session variables and that’s not all… our RPD security too! Yes, even row level security is respected when we press the “Unify” button and data is brought back into Tableau. So now, there is no reason to lose years of metadata work because one team prefers to visualize with Tableau instead of OBIEE. Unify allows us to import only those data needed for the report, as we can utilize ‘in-tool’ filtering, keeping our query sets small, and our performance high. In sum, Unify unites it all - have your cake and eat it too. No matter which tool you love the most, add them together and you will certainly love them both more. The ODTUG Kscope17 conference last week in San Antonio was a great event with plenty of very interesting sessions and networking opportunities. Rittman Mead participated during the thursday deep dive BI session and delivered three sessions including a special "fishing" one. In the meantime Oracle released Data Visualization Desktop 12.2.3.0.0 which was presented in detail during Philippe Lions session and includes a set of new features and enhancements to already existing functionalities. Starting from new datasources, through new visualization options, in this post I'll go in detail on each of them. OData: Open Data Protocol, a standard protocol for RESTful APIs. The latter two (still in beta) are very relevant since they enable querying any product directly exposing JDBC or ODBC connectors (like Presto) without needing to wait for the official support in the DVD list of sources. Still in DVD v3 there is no support for JSON or XML files. In my older blog post I wrote how JSON (and XML) can be queried in DVD using Apache Drill, however this solution has Drill installation and knowledge as a prerequisite which is not always achievable in end users environment where self-service BI is happening. I believe future versions of DVD will address this problem by providing full support to both data sources. One of the most requested new features is the new interface to connect to OBIEE: until DVD v2 only pre-built OBIEE analysis could be used as sources, with DVD v3 OBIEE Subject Areas are exposed making them accessible. The set of columns and filters can't be retrieved on the fly during the project creation but must be defined upfront during datasource definition. This feature avoids move back and forth from OBIEE to DVD to create an analysis in as datasource, and then use it in DVD. 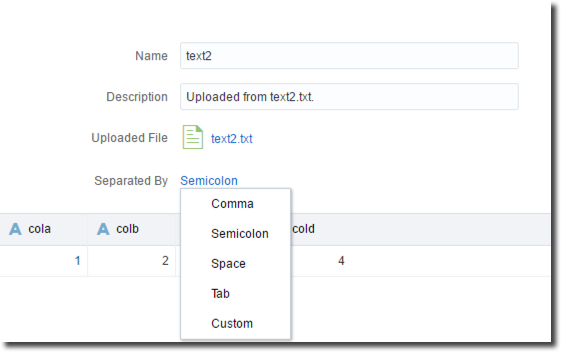 Another enhancement in the datasource definition is the possibility to change the column delimiter in txt sources, useful if the datasource has an unusual delimiters. On the data-preparation side we have two main enhancements: the convert-to-date and the time grain level. 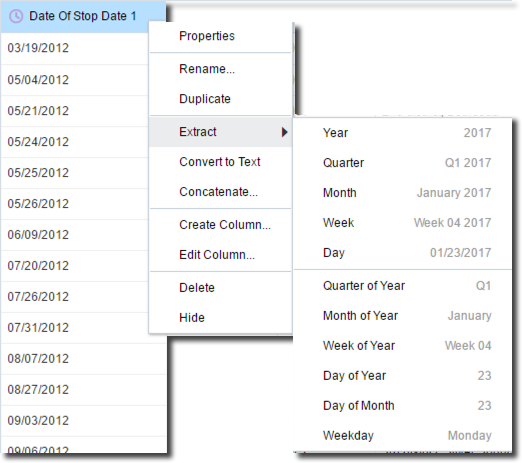 The convert-to-date feature enhances ability for columns to date conversion including the usage of custom parsing strings. Still this feature has some limits like not being able to parse dates like 04-January-2017 where the month name is complete. 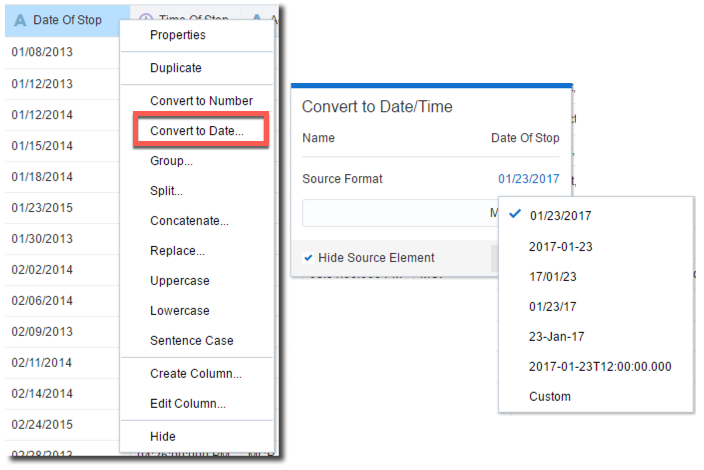 For this date format a two step approach, reducing the month-name and then converting, is still required. The second enhancement in the data preparation side is the time grain level and format, those options simplify the extraction of attributes (e.g. Month, Week, Year) from date fields which can now be done visually instead of writing logical SQL. 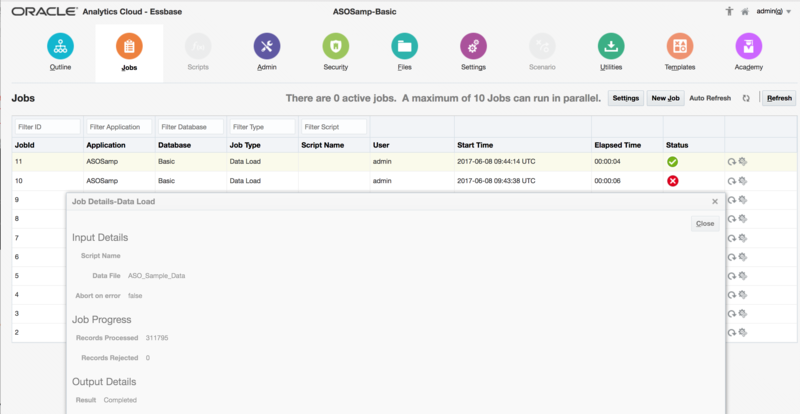 The Dataflow component in DVD v3 has an improved UI with new column merge and aggregation functionalities which makes the flow creation easier. Its output can now be saved as Oracle database or Hive table eliminating the need of storing all the data locally. It's worth mentioning that Dataflow is oriented to self-service data management: any parsing or transformation happens on the machine where DVD is installed and its configuration options are limited. If more robust transformations are needed then proper ETL softwares should be used. Top N and bottom N filtering has been added for each measure columns expanding the traditional "range" one. Two new visualizations have also been included: waterfall and boxplot are now default visualizations. Boxplots were available as plugin in previous versions, however the five number summary had to be pre-calculated; in DVD v3 the summary is automatically calculated based on the definition of category (x-axis) and item (value within the category). 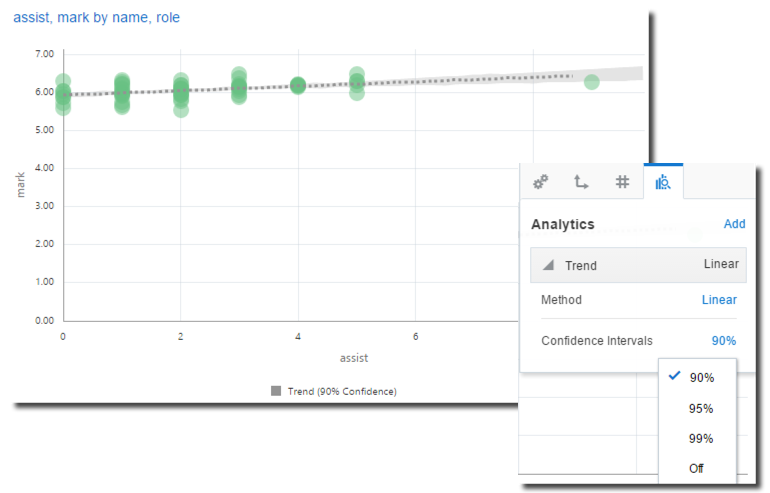 Other new options in the data visualization area include: the usage of logarithmic scale for graphs, the type of interpolation line to use (straight, curved, stepped ...), and the possibility to duplicate and reorder canvases (useful when creating a BI story). The latest set of enhancements regard the console: this is a new menu allowing end users to perform task like the upload of a plugin that before were done manually on the file system. Map Layers: JSON shape files that can be used to render custom maps data. The process to include a new plugin into DVD v3 is really simple: after downloading it from the store, I just need open DVD's console and upload it. After a restart of the tool, the new plugin is available. The same applies for Map Layers, while custom R scripts still need to be stored under the advanced_analytics\script_repository subfolder under the main DVD installation folder. 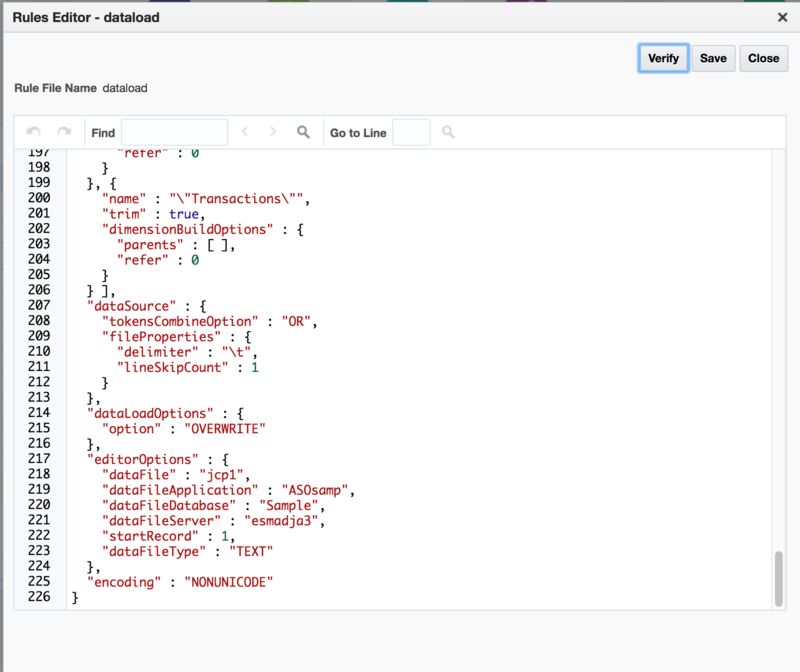 As we saw in this blog post, the new Data Visualization Desktop release includes several enhancement bringing more agility in the data discovery with enhancements both in the connections to new sources (JDBC and ODBC) and standard reporting with OBIEE subject areas now accessible. The new visualizations, the Analytics Store and the plugin management console make the end user workflow extremely easy also when non-default features need to be incorporated. If you are interested in Data Visualization Desktop and want to understand how it can be proficiently used against any data source don't hesitate to contact us! There are many types of scenarios in which data science could help your business. For example, customer retention, process automation, improving operational efficiency or user experience. It is not however always initially clear which questions to concentrate on, or how to achieve your aims. This post presents information about the type of questions you could address using your data and common forms of bias that may be encountered. Descriptive: Describe the main features of the data, no implied meaning is inferred. This will almost always be the first kind of analysis performed on the data. Exploratory: Exploring the data to find previously unknown relationships. Some of the found relationships may define future projects. Inferential: Looking at trends in a small sample of a data set and extrapolating to the entire population. In this type of scenario you would end up with an estimation of the value and an associated error. Inference depends heavily on both the population and the sampling technique. Predictive: Look at current and historical trends to make predictions about future events. Even if x predicts y, x does not cause y. Accurate predictions are hard to achieve and depend heavily on having the correct predictors in the data set. Arguably more data often leads to better results however, large data sets are not always required. Causal: To get the real relationship between variables you need to use randomised control trials and measure average effects. i.e. if you change x by this much how does y change. Even though this can be carried out on observed data huge assumptions are required and large errors would be introduced into the results. It is very easy to introduce biases into your data or methods if you are not careful. Selection/sampling bias: If the population selected does not represent the actual population, the results are skewed. This commonly occurs when data is selected subjectively rather than objectively or when non-random data has been selected. Confirmation bias: Occurs when there is an intentional or unintentional desire to prove a hypothesis, assumption, or opinion. Outliers: Extreme data values that are significantly out of the normal range of values can completely bias the results of an analysis. If the outliers are not removed in these cases the results of the analysis can be misleading. These outliers are often interesting cases and ought to be investigated separately. Simpson's Paradox: A trend that is indicated in the data can reverse when the data is split into comprising groups. Overfitting: Involves an overly complex model which overestimates the effect/relevance of the examples in the training data and/or starts fitting to the noise in the training data. Underfitting: Occurs when the underlying trend in the data is not found. Could occur if you try to fit a linear model to non linear data or if there is not enough data available to train the model. Confounding Variables: Two variables may be assumed related when in fact they are both related to an omitted confounding variable. This is why correlation does not imply causation. 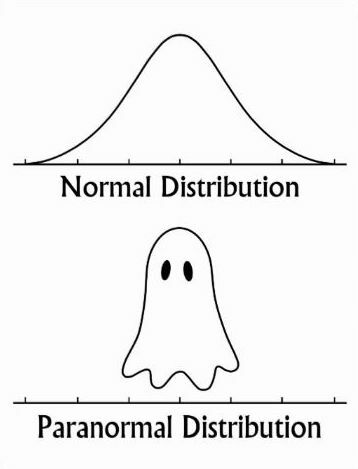 Non-Normality: If a distribution is assumed to be normal when it is not the results may be biased and misleading. Data Dredging: This process involves testing huge numbers of hypotheses about a single data set until the desired outcome is found. Comics from Dilbert Comics By Scott Adams. To learn more about the Rittman Mead Insights Lab please read my previous blog post about our methodology. Under the time-honoured on-prem install of Essbase, the sample applications were available as an install option – supplied data has to be loaded separately, but the applications / cubes themselves are installed as part of the process if the option is selected. This is not quite the same under OAC – some are provided in an easily installable format, but they are not immediately available out-of-the-box. 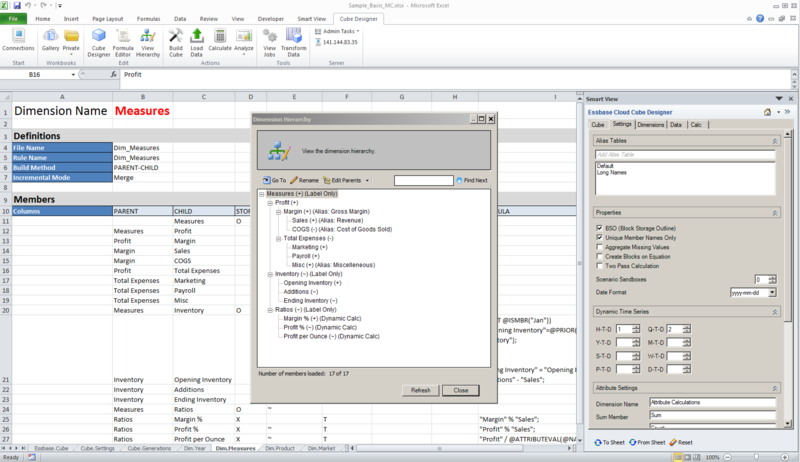 One of the main methods of cube creation in Essbase under OAC is via the Import of a specifically formatted Excel spreadsheet, and it is via the provision of downloadable pre-built ‘template’ spreadsheets that the sample applications are installed in this version. Return to the home page, and click Import. 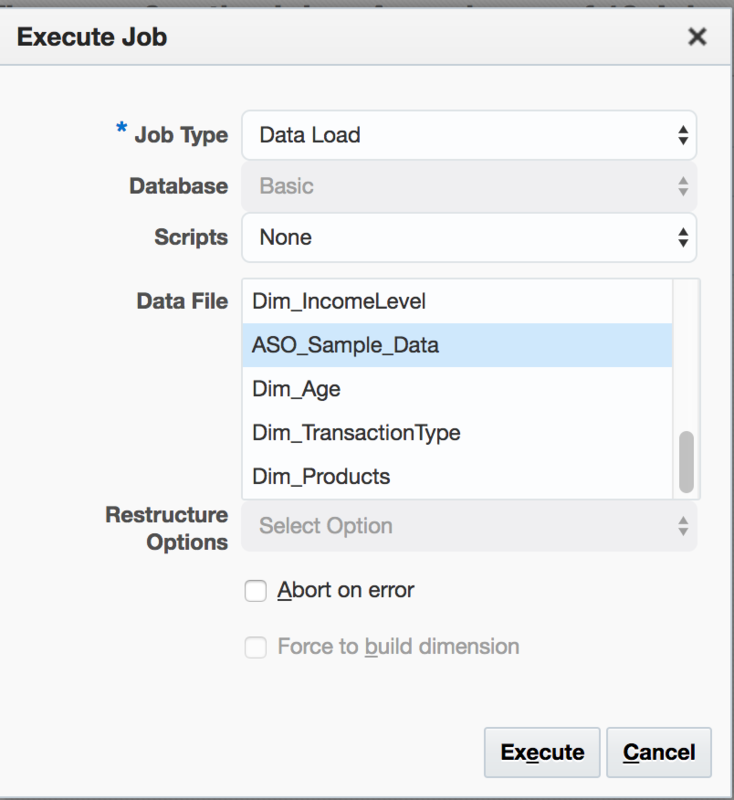 Choose the spreadsheet downloaded as Aggregate Storage Sample (ASO_Sample.xlsx) and click Deploy and Close. The current status of the job is shown – in this case, ‘in progress’ – and the screen can be refreshed. ...which is familiar-looking: just what we would expect from a EAS export (MAXL: export database), which can of course just be loaded in a similar no-rules-file way in on prem. This ‘standard’ load works in overwrite mode – any new values in the file will be added, but any that exist already will be overwritten: running the load again and refreshing the Smartview report results in the same numbers confirms this. So, how might we load the same sort of flat, tab delimited file of the like supplied as the on-prem ASOSamp.Sample data file ? 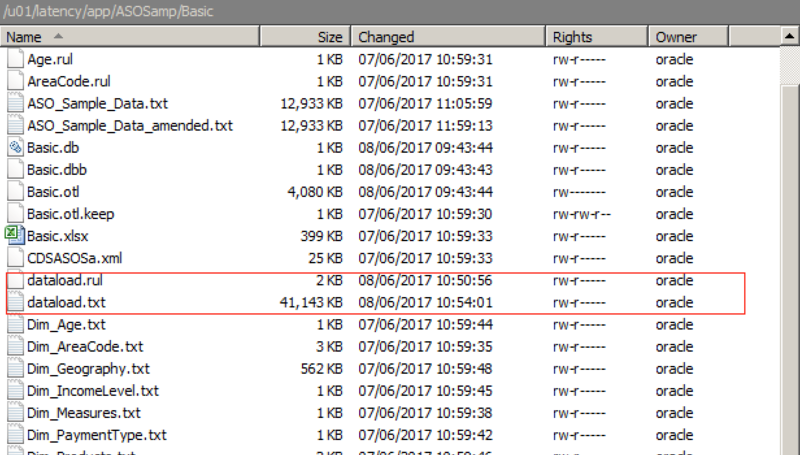 As above, files can be uploaded to OAC, so putting the dataload.txt data file from the on-prem release into OAC is straightforward. However, as you’d expect, attempting to run this as a load job without a rules file results in an error. The job runs successfully, with the ‘Details’ overlay confirming the successful record count. It would seem logical that changing the dataLoadOptions value at line 215 to a value other than OVERWRITE (eg ADD) might be a quick behavioural change for the load that would be easy to effect. However, making this change resulted in verification errors. Noting that the errors related to invalid dimension names, an attempt was made to verify the actual, unchanged rules file as uploaded…which also resulted in the same verification errors. So somewhat curiously, the uploaded on-prem rules file can be successfully used to load a corresponding data file, but (effectively) can’t be edited or amended. Note that we are retaining all data, and have the Load Data box checked. Checks confirm the values in the file are added to those already in the cube. Note that unlike running this method under OAC, the rules file (which was created by the initial import as the Data tab existed in the spreadsheet at that point) has to be selected manually. Running locally, a successful EssCS login effectively starts a session that then remains open for other EssCS commands until the session is closed with a logout command. As above, the connection is made and is verified by the successful running of another command (eg version), but the logout command produced an error. Despite this, the logout appeared successful – no other EssCS commands worked until a login was re-issued. …although the file types is a fixed list – for example, you don’t seem to be able to use a wild card to pick up all spreadsheet files. Whilst there is an Upload (and Download) facility, there does not seem to be the means to delete a remote file…which is a bit of an inconvenience, because using Upload to upload a file that already exists results in an error, and there is no overwrite option. The dataload.txt and dataload.rul files previously uploaded via the OAC front end were therefore manually deleted via OAC, and verified using Listfiles. Note that the file list in OAC does not refresh with a browser page refresh or any ‘sort’ operation: use Refresh under Actions as above. There are some minor differences between them, which may affect which you may wish to use for any particular scenario. Arguably, given the availability of MAXL, there is a further custom method available as the actual data load can be effected that way too. This will be explored further in the next post that will start to consider how these tools might be used for real scenarios. What is our Insights Lab? The Insights Lab offers on-demand access to an experienced data science team, using a mature methodology to deliver one-off analyses and production-ready predictive models. Our Data Science team includes physicists, mathematicians, industry veterans and data engineers ready to help you take analytics to the next level while providing expert guidance in the process. Data is cheaper to collect and easier to store than ever before. But collecting the data is not synonymous with getting value from it. Businesses need to do more with the same budget and are starting to look into machine learning to achieve this. These processes can take off some of the workload, freeing up people's time to work on more demanding tasks. However, many businesses don't know how to get started down this route, or even if they have the data necessary for a predictive model. Our Data science team primarily work using the R programming language. R is an open source language which is supported by a large community. The functionality of R is extended by many community written packages which implement a wide variety of statistical and graphical techniques, including linear and nonlinear modeling, statistical tests, time-series analysis, classification, clustering as well as packages for data access, cleaning, tidying, analysing and building reports. All of these packages can be found on the Comprehensive R Archive Network (CRAN), making it easy to get access to new techniques or functionalities without needing to develop them yourself (all the community written packages work together). R is not only free and extendable, it works well with other technologies and makes it an ideal choice for businesses who want to start looking into advanced analytics. 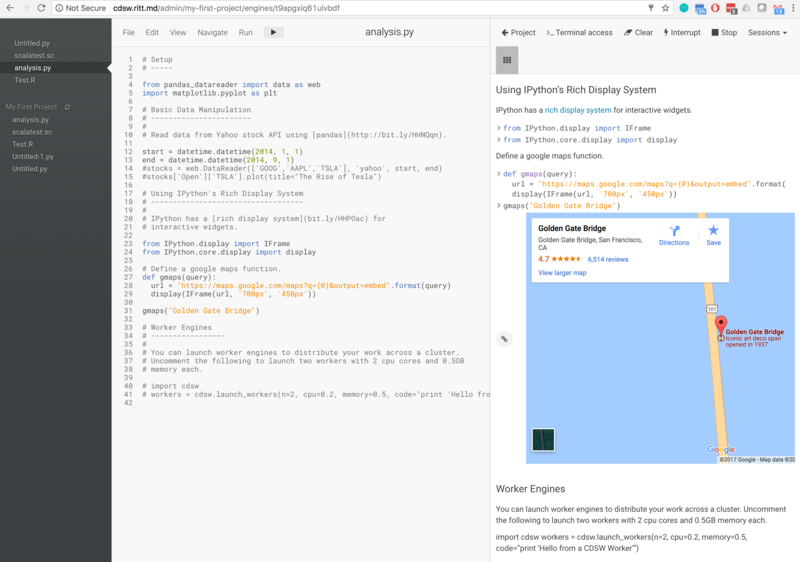 Python is an obvious alternative, and several of our data scientists prefer it. We're happy to use whatever our client's teams are most familiar with. Experienced programmers will find R syntax easy enough to pick up and will soon be able to implement some form of machine learning. However, for a detailed introduction to R and a closer look at implementing some of the concepts mentioned below we do offer a training course in R.
Analytics, for all intents and purposes, is a scientific discipline and as such requires a hypothesis to test. That means having a specific question to answer using the data. Starting this process without a question can lead to biases in the produced result. This is called data dredging - testing huge numbers of hypotheses about a single data set until the desired outcome is found. Many other forms of bias can be introduced accidentally; the most commonly occurring will be outlined in a future blog post. Once a question is defined, it is also important to understand which aspects of the question you are most interested in. Associated, is the level of uncertainty or error that can be tolerated if the result is to be applied in a business context. 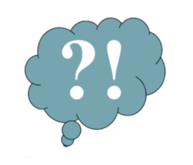 Questions can be grouped into a number of types. Some examples will be outlined in a future blog post. The data you expect to be relevant to your question needs to be collated. Maybe supplementary data is needed, or can be added from different databases or web scraping. This data set then needs to be cleaned and tidied. This involves merging and reshaping the data as well as possibly summarising some variables. For example, removing spaces and non-printing characters from text and converting data types. The data may be in a raw format, there may be errors in the data collection, or corrupt or missing values that need to be managed. These records can either be removed completely or replaced with reasonable default values, determined by which makes the most sense in this specific situation. If records are removed you need to ensure that no selection biases are being introduced. All the data should be relevant to the question at hand, anything that isn't can be removed. There may also be external drivers for altering the data, such as privacy issues that require data to be anonymised. Natural language processing could be implemented for text fields. This takes bodies of text in human readable format such as emails, documents and web page content and processes it into a form that is easier to analyse. Any changes to the dataset need to be recorded and justified. Exploratory data analysis involves summarising the data, investigating the structure, detecting outliers / anomalies as well as identifying patterns and trends. It can be considered as an early part of the model production process or as a preparatory step immediately prior. Exploratory analysis is driven by the data scientist, enabling them to fully understand the data set and make educated decisions; for example the best statistical methods to employ when developing a model. The relationships between different variables can be understood and correlations found. As the data is explored, different hypotheses could be found that may define future projects. Visualisations are a fundamental aspect of exploring the relationships in large datasets, allowing the identification of structure in the underlying dataset. This is also a good time to look at the distribution of your dataset with respect to what you want to predict. This often provides an indication of the types of models or sampling techniques that will work well and lead to accurate predictions. Variables with very few instances (or those with small variance) may not be beneficial, and in some cases could even be detrimental, increasing computation time and noise. Worse still, if these instances represent an outlier, significant (and unwarranted) value may be placed on these leading to bias and skewed results. The data set is split into two sub groups, "Training" and "Test". The training set is used only in developing or "training" a model, ensuring that the data it is tested on (the test set) is unseen. This means the model is tested in a more realistic context and will help to determine whether the model has overfitted to the training set. i.e. is fitting random noise in addition to any meaningful features. Taking what was learned from the exploratory analysis phase, an initial model can be developed based on an appropriate application of statistical methods and modeling tools. There are many different types of model that can be applied to the data, the best tends to depend on the complexity of your data and the any relationships that were found in the exploratory analysis phase. During training, the models are evaluated in accordance with an appropriate metric, the improvement of which is the "goal" of the development process. The predictions produced from the trained models when run on the test set will determine the accuracy of the model (i.e. how closely its predictions align with the unseen real data). A particular type of modelling method, "machine learning" can streamline and improve upon this somewhat laborious process by defining models in such a way that they are able to self optimise, "learning" from past iterations to develop a superior version. Broadly, there are two types, supervised and un-supervised. A supervised machine learning model is given some direction from the data scientist as to the types of methods that it should use and what it is expecting. Unsupervised machine learning on the other hand, as the name suggests, involves giving the model less information to start with and letting it decide for its self what to value, and how to approach the problem. This can help to remove bias and reduce the number of assumptions made but will be more computationally intensive, as the model has a broader scope to investigate. Usually supervised machine learning is employed in a case where the problem and data set are reasonably well understood, and unsupervised machine learning where this is not the case. Complex predictive modelling algorithms perform feature importance and selection internally while constructing models. These models can also report on the variable importance determined during the model preparation process. This is an important part of any scientific process, and effectively utilities our broad expertise in modelling at Rittman Mead. This enables us to be sure no biases were introduced that could lead to a misleading prediction and that the accuracy of the models is what could be expected if the model was run on new unseen data. Additional expert views can also lead to alternative potential avenues of investigation being identified as part of an expanded or subsequent study. For a scientific investigation to be credible the results must be reproducible. The reports we produce are written in R markdown and contain all the code required to reproduce the results presented. This also means it can be re-run with new data as long as it is of the same format. A clear and concise description of the investigation from start to finish will be provided to ensure that justification and context is given for all decisions and actions. 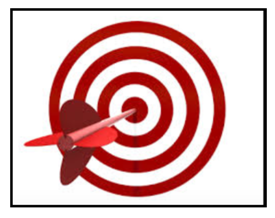 If the result is of the required accuracy we will deploy a model API enabling customers to start utilising it immediately. There is always a risk however that the data does not contain the required variables to create predictions with sufficient confidence for use. In these cases, and after the exploratory analysis phase there may be other questions that would be beneficial to investigate. This is also a useful result, enabling us to suggest additional data to collect that may allow a more accurate result should the process be repeated later. - Monitoring performance and accuracy against the observed, actual values over a period of time. Should there be discrepancies between these values arise, these can be used to identify the need for alterations to the model. - Exploring specific exceptions to the model. There may be cases in which the model consistently performs poorly. Instances like these may not have existed in the training set and the model could be re-trained accordingly. If they were in the training set these could be weighted differently to ensure a better accuracy, or could be represented by a separate model. - Updates to the model to reflect discrepancies identified through monitoring, changes of circumstance, or the availability of new data. - Many problems are time dependent and so model performance is expected to degrade, requiring retraining on more up to date data. 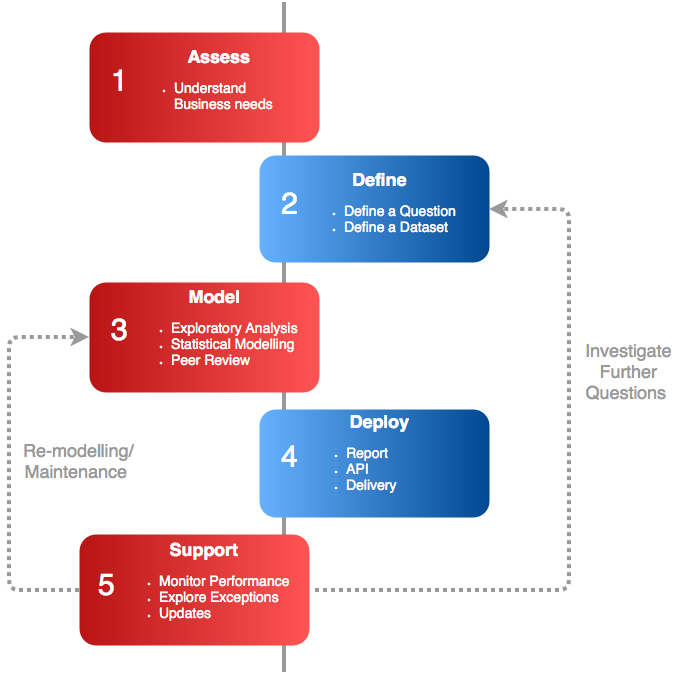 In conclusion our Insights lab has a clearly defined and proven process for data science projects that can be adapted to fit a range of problems. Contact us to learn how Insights Lab can help your organization get the most from its data, and schedule your consultation today. While I found her entire presentation extremely interesting, that statement in particular really made me think. When I view a visualization or report, am I truly understanding what the results are telling me? Personally, when I’m presented a chart or graph I tend to take what I’m seeing as absolute fact, but often there’s a bit of nuance there. When we have a fair amount of variance or uncertainty in our data, what are some effective ways to communicate that to our intended audience? 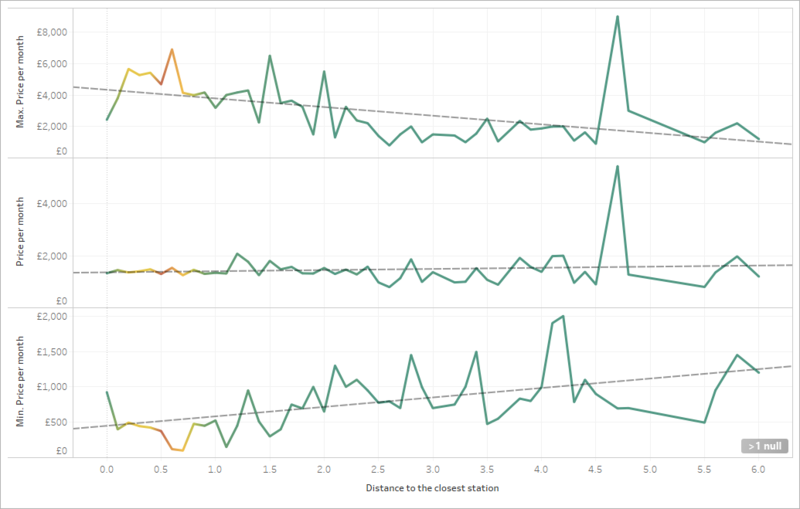 In this blog I'll demonstrate some examples of how to show uncertainty and variance in Tableau. 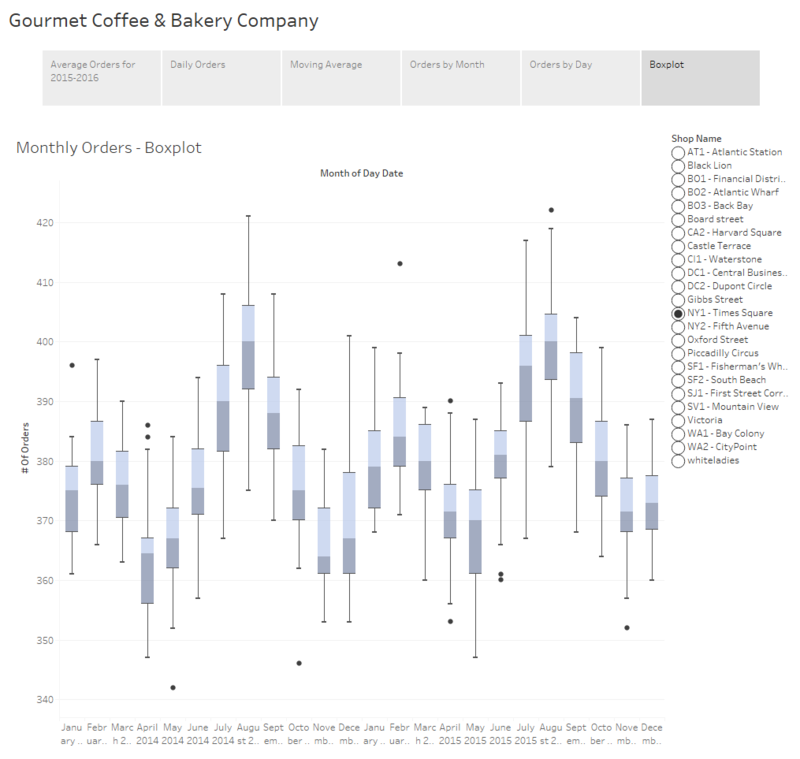 All of the following visualizations are made using Tableau Public so while I won’t go into all the nitty-gritty detail here, follow this link to download the workbook and reverse engineer the visualizations yourself if you'd like. First things first, I need some data to explore. 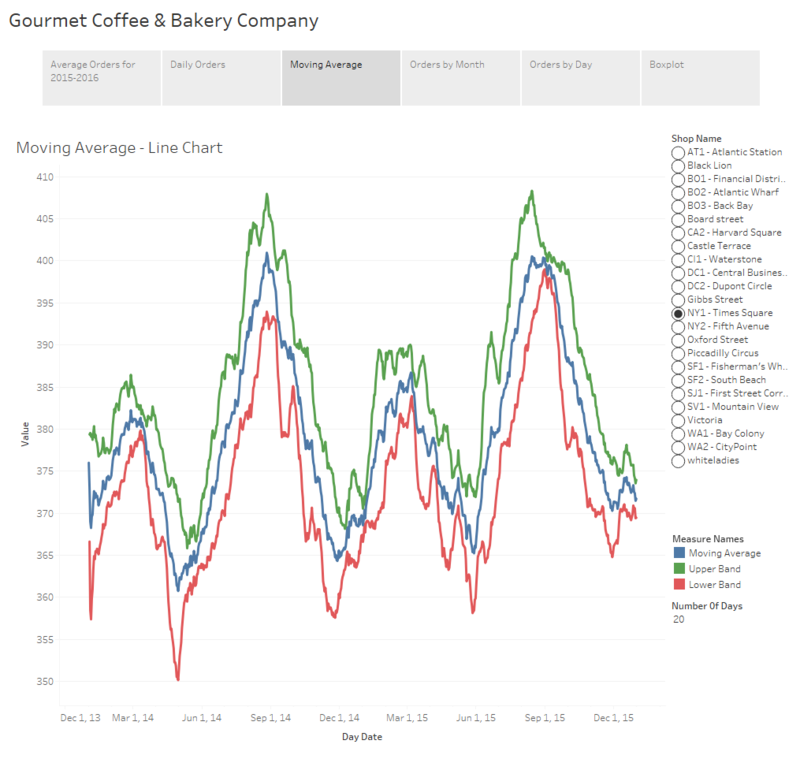 If you've ever taken our training you might recall the Gourmet Coffee & Bakery Company (GCBC) data that we use for our courses. Since I’m more interested in demonstrating what we can do with the visualizations and less interested in the actual data itself, this sample dataset will be more than suitable for my needs. I'll begin by pulling the relevant data into Tableau using Unify. 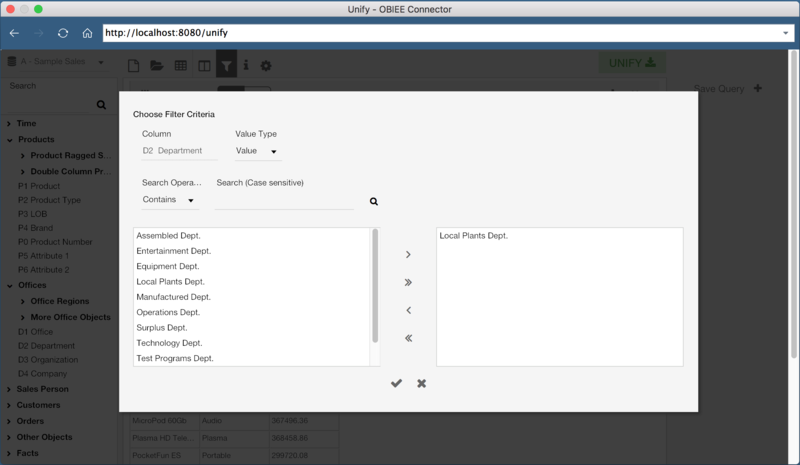 If you haven't already heard about Unify, it allows Tableau to seamlessly connect to OBIEE so that you can take advantage of the subject areas created there. Now that I have some data, let’s look at our average order history by month. To keep things simple, I’ve filtered so that we’re only viewing data for Times Square. On this simple visualization we can already draw some insights. We can see that the data is cyclical with a peak early in the year around February and another in August. 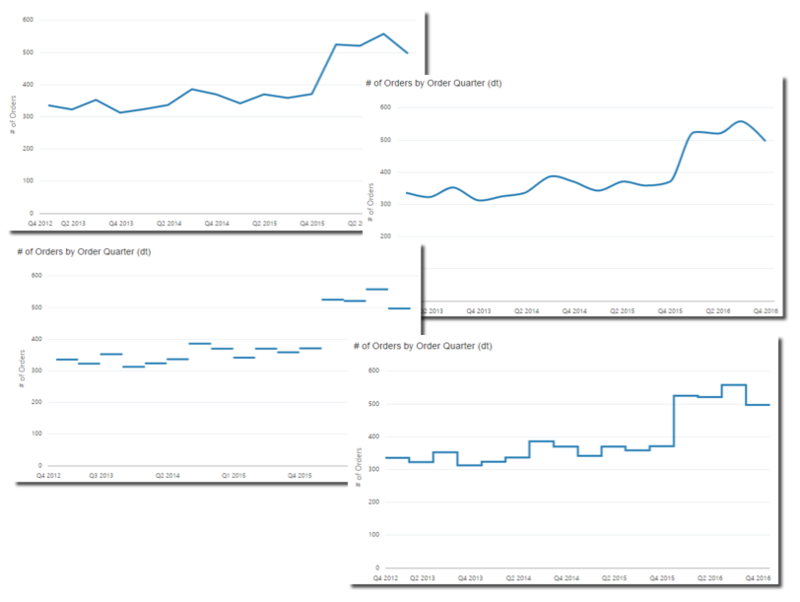 We can also visually see the minimum number of orders in a month appears to be about 360 orders while the maximum is just under 400 orders. When someone asks to see “average orders by month”, this is generally what people expect to see and depending upon the intended audience a chart like this might be completely acceptable. However, when we display aggregated data we no longer have any visibility into the variance of the underlying data. If we display the orders at the day level instead of month we can still see the cyclical nature of the data but we also can see additional detail and you’ll notice there’s quite a bit more “noise” to the data. We had a particularly poor day in mid-May of 2014 with under 350 orders. We’ve also had a considerable number of good days during the summer months when we cleared 415 orders. Depending upon your audience and the dataset, some of these charts might include too much information and be too busy. If the viewer can’t make sense of what you’re putting in front of them there’s no way they’ll be able to discern any meaningful insights from the underlying dataset. Visualizations must be easy to read. One way to provide information about the volatility of the data but with less detail would be to use confidence bands, similar to how one might view stock data. In this example I’ve calculated and displayed a moving average, as well as upper and lower confidence bands using the 3rd standard deviation. Confidence bands show how much uncertainty there is in your data. When the bands are close you can be more confident in your results and expectations. An additional option is the use of a scatterplot. The awesome thing about a scatterplots is that not only does it allow you to see the variance of your data, but if you play with the size of your shapes and tweak the transparency just right, you also get a sense of density of your dataset because you can visualize where those points lie in relation to each other. The final example I have for you is to show the distribution of your data using a boxplot. If you’re not familiar with boxplots, the line in the middle of the box is the median. The bottom and top of the box, known as the bottom and top hinge, give you the 25th and 75th percentiles respectively and the whiskers outside out the box show the minimum and maximum values excluding any outliers. Outliers are shown as dots. I want to take a brief moment to touch on a fairly controversial subject of whether or not to include a zero value in your axes. When you have a non-zero baseline it distorts your data and differences are exaggerated. This can be misleading and might lead your audience into drawing inaccurate conclusions. For example, a quick Google search revealed this image on Accuweather showing the count of tornados in the U.S. for 2013-2016. At first glance it appears as though there were almost 3 times more tornados in 2015 than in 2013 and 2014, but that would be incorrect. On the flipside, there are cases where slight fluctuations in the data are extremely important but are too small to be noticed when the axis extends to zero. Philip Bump did an excellent job demonstrating this in his "Why this National Review global temperature graph is so misleading" article in the The Washington Post. 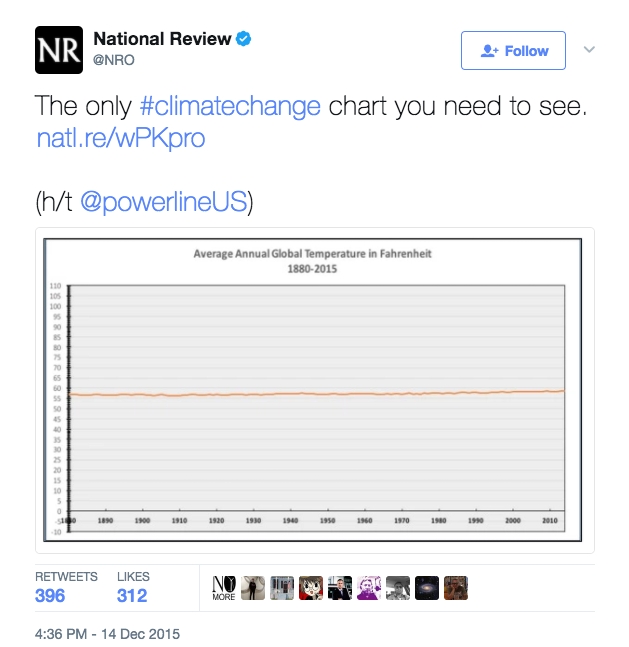 Philip begins his article with this chart tweeted by the National Review which appears to prove that global temperatures haven’t changed in the last 100 years. As he goes on to explain, this chart is misleading because of the scale used. The y-axis stretches from -10 to 110 degrees making it impossible to see a 2 degree increase over the last 50 years or so. The general rule of thumb is that you should always start from zero. 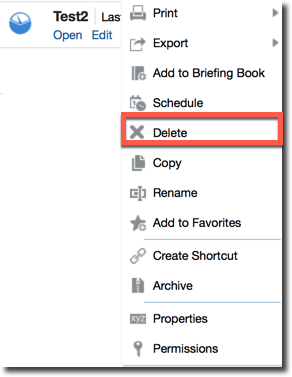 In fact, when you create a visualization in Tableau, it includes a zero by default. Usually, I agree with this rule and the vast majority of the time I do include a zero, but I don’t believe there can be a hard and fast rule as there will always be an exception. Bar charts are used to communicate absolute values so the size of that bar needs to be proportional to the overall value. I agree that bar charts should extend to zero because if it doesn’t we distort what the data is telling us. With line charts and scatterplots we tend to look at the positioning of the data points relative to each other. Since we’re not as interested in the value of the data, I don’t feel the decision to include a zero or not is as cut and dry. The issue boils down to what it is you’re trying to communicate with your chart. In this particular case, I’m trying to highlight the uncertainty so the chart needs to draw attention to the range of that uncertainty. For this reason, I have not extended the axes in the above examples to zero. You are free to disagree with me on this, but as long as you’re not intentionally misleading your audience I feel that in instances such as these this rule can be relaxed. These are only a few examples of the many ways to show uncertainty and variance within your data. Displaying the volatility of the data and giving viewers a level of confidence in the results is immensely powerful. Remember that while we can come up with the most amazing visualizations, if the results are misleading or misinterpreted and users draw inaccurate conclusions, what’s the point? I wrote a blog post a while ago describing the catalog validation: an automated process performing a consistency check of the catalog and reporting or deleting the inconsistent artifacts. In the post I stated that catalog validation should be implemented regularly as part of the cleanup routines and provides precious additional information during the pre and post upgrade phases. 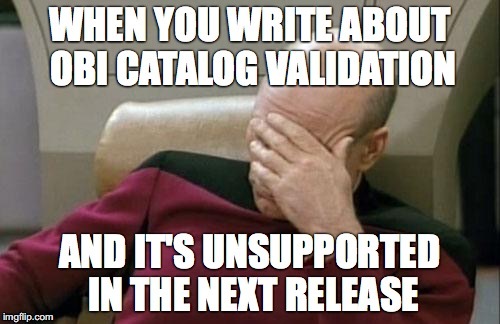 The question then became: How do we run the catalog validation since the known procedure is unsupported? The answer is in catalog manager and the related command line call runcat.sh which, in the server installations (like the SampleApp v607p), can be found under $DOMAIN_HOME/bitools/bin. As for most of command line tools, when you don't have a clue on how it works, the best approach is to run with the -help option which provides the list of parameters to pass. Unfortunately none of the options in the list seems to be relevant for catalog validation, but with a close look at the recently updated Doc ID 2199938.1 I could find the parameter to pass: validate. In my previous blog I mentioned different types of validation. What type of validation is the default command going to implement? How can I change the behaviour? Again the -help option provides the list of instructions. Enterprise Edition's Presentation Services Administration Guide. -links (None | Report | Clean)        Default is 'Clean'. Also, '-items' cannot be 'None'. -homes (None | Report | Clean)        Default is 'Report'. Also, '-accounts' cannot be 'None'. -offline: the catalog validation needs to happen offline. Either with services down or on a copy of the live catalog. Running catalog validation on a online catalog is dangerous especially with "Clean" options since could delete content in use. Default is 'Clean': some validations have a "Clean" as default value, meaning that will solve the issue by removing the inconsistent object, this may be inappropriate in some cases. runcat.sh output is displayed direcly in the console, I'm redirecting it to a file called cat_validation.log for further analysis. If, after the initial run with all options to Report you want the catalog validation utility to "fix" the inconsistent objects, just change the desired options to Clean. Please make sure to take a backup of the catalog before since the automatic fix is done by removing the related objects. Moreover ensure that catalog validation is working on a offline catalog. The command itself can work on top on a online catalog but is never a good idea checking a catalog that could potentially be changed while the tool is running. Let's see few examples of how Catalog Validation spots inconsistent objects. For the purpose of this test I'll work with Oracle's Sampleapp. As written in the logs looks like the user folder has permission problems. How can we solve this? 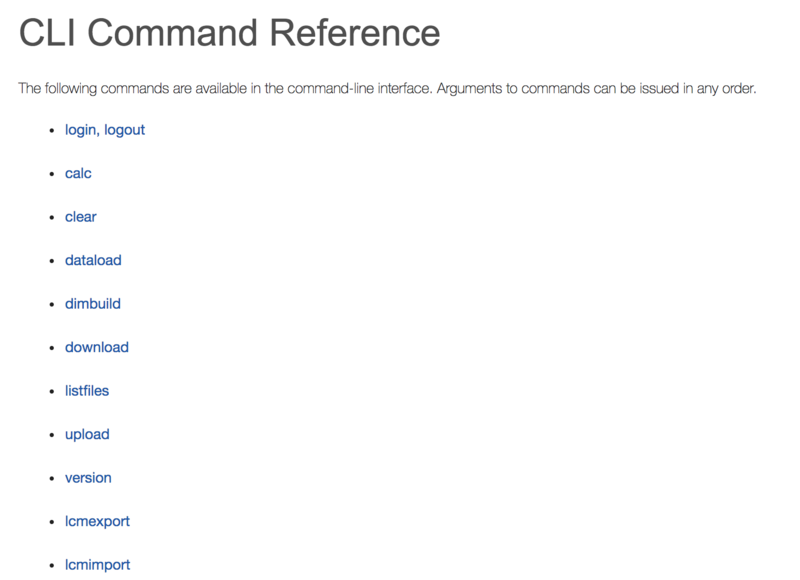 One option is to use again the runcat.sh command with the forgetAccounts option to remove the inconsistent homes. However this solution deletes all the content related to the user that was stored under the "My Folders". In order to keep the content we need to overwrite the folder's permission with an administrator account. Unfortunately, when right-clicking on the folder, the "Permission" option is not available. 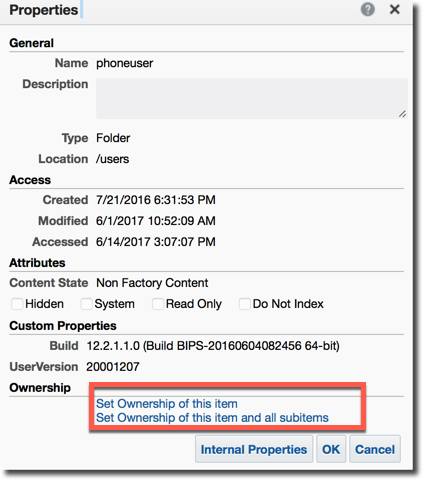 As a workaround I found that clicking on Properties and then on Set Ownership of this item and all subitems allows you to grant full access to the administrator which is then able to reset the proper user the relevant access privilege. Once the workaround is implemented the users is able to check his "My Folder" content, however the the errors are still present in catalog validation. The solution is storing the relevant artifacts in another part of the catalog, run runcat.sh with forgetAccounts option and then reimport the objects if needed. 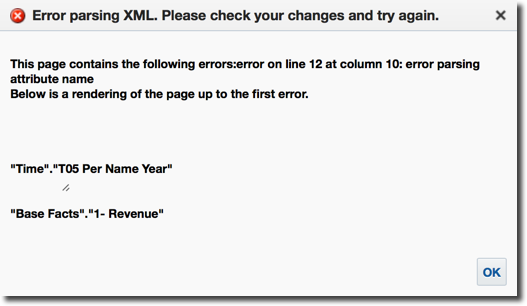 Invalid XML: The object (analysis or dashboard) XML code is not valid. This can be caused by errors during the write to disk or problems during migrations. Broken Links: analysis contained in a dashboard or linked from other analysis have been renamed or deleted. Let's see how catalog validation shows the errors. To test this case I created a simple analysis with two columns and then went to the Advanced tab and deliberately removed an > to make the XML invalid. When trying to applying the change I got the following error which denied me the possibility to save. Since I really wanted to ruin my analysis I went directly to the file system under $BI_HOME/bidata/service_instances/ssi/metadata/content/catalog/root/shared/$REQUEST_PATH and changed the XML directly there. After than I run the catalog validation with only the flag items equal to Report and the rest set to None since I'm looking only at invalid XMLs. Which tells me that my analysis notworkinganalysis is invalid with an unterminated start tag, exactly the error I was expecting. Now I have two choices: either fixing the analysis XML manually or rerunning the catalog validation with option Clean which will delete the analysis since it's invalid. As said before there is no automated fix. After clicking to Apply OBIEE already tells me that there is something wrong in the analysis. But since it allows me to save and since I feel masochist I saved the analysis. But... when running the catalog validation as before I end up seeing 0 errors related to my notworkinganalysis. The answer to Jackie Chan question is that I got 0 errors since in this second case the XML is still valid. Removing a " doesn't make the XML syntax invalid! 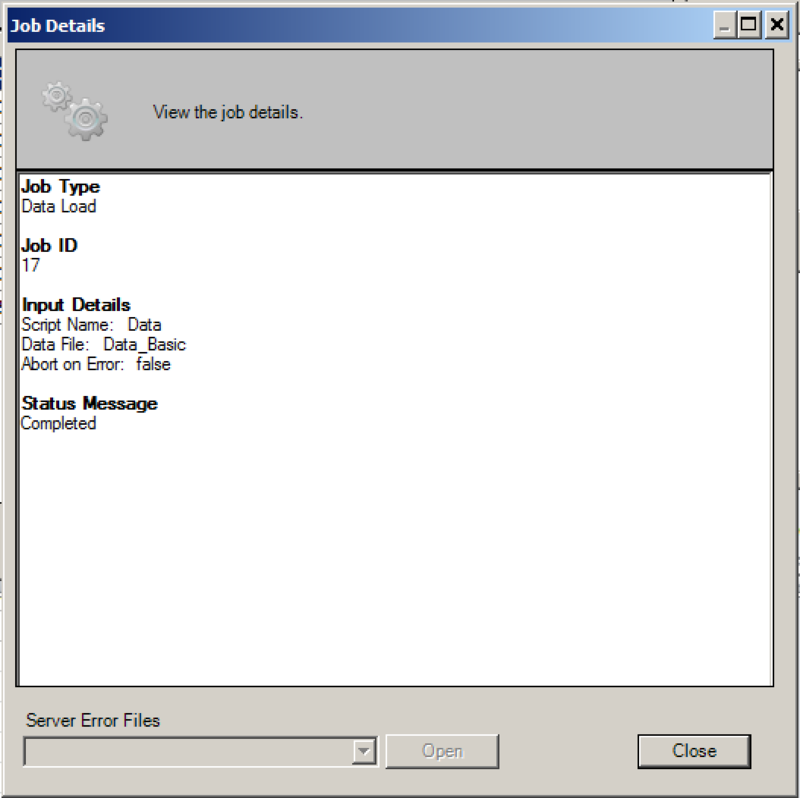 In order to find and solve that error we would need to use Oracle's Baseline Validation Tool. Dashboard TestDashboard which contains the TargetAnalysis object. In order to break things I then deleted the TargetAnalysis. N1    saw.catalog.impl.scour.validateDeadLink Referenced path /shared/RM Demo/TargetAnalysis in file /shared/RM Demo/_portal/TestDashboard/page 1 is inaccessible. But I don't get anything on the SourceRequest object, for which navigation is failing. Summarizing the broken link validation reports if missing objects are included in the main definition of other objects (as filters or as parts of dashboards) but doesn't seem to report if the missing object is only linked via an action. My experiments show that catalog validation finds some errors like invalid homes, XML files and broken links which otherwise users would hit at the run-time and that won't make them happy. But there are still some errors which it doesn't log like analysis with wrong column syntax, luckily for most of the cases other tools like the Baseline Validation can spot them easily so use all you have, use as frequently as possible and if you want more details about how it works and how it can be included in the automatic checks for code promotions don't hesitate to contact us! Not a long time ago a friend of mine spent a significant amount of time trying to find a flat to rent. And according to what he said it wasn't an easy task. It took him a decent time and efforts to find something that is big enough (but not too big) not too far from a workplace, had required features and affordable at the same time. And as a specialist in data analysis, I prefer to think about this task as a data discovery one (yes, when you have a hammer everything looks like a nail). 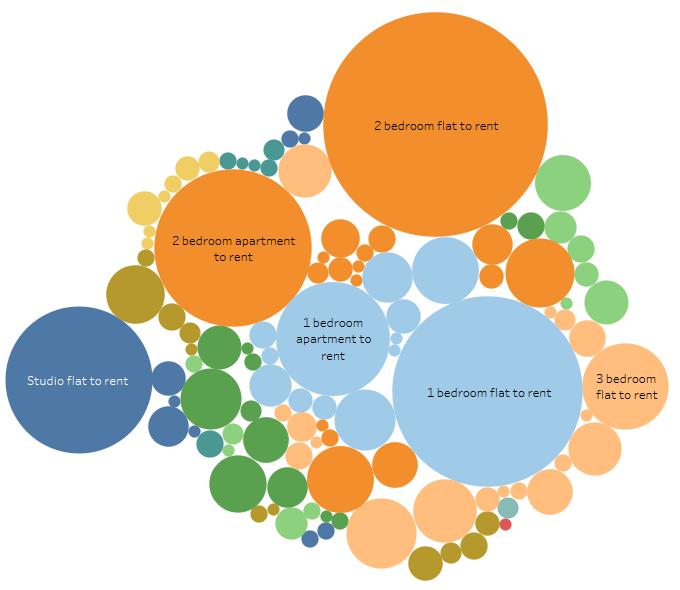 And I decided to see if a data analysis tool can help me understand the rental market better. I'm sure you've already read the name of this post so I can't pretend I'm keeping intrigue. 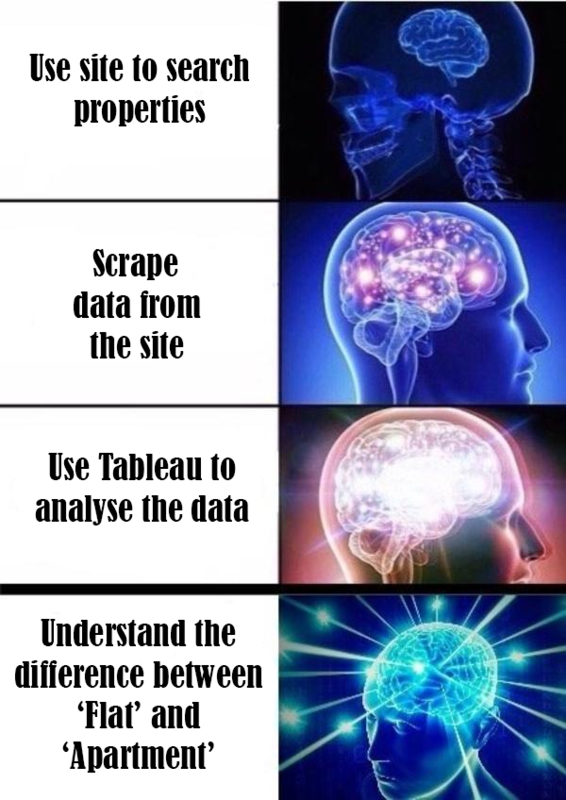 This tool is Tableau 10.3. The friend I was talking before was looking for a flat in Moscow, but I think that this market is completely unknown to the most of the readers. 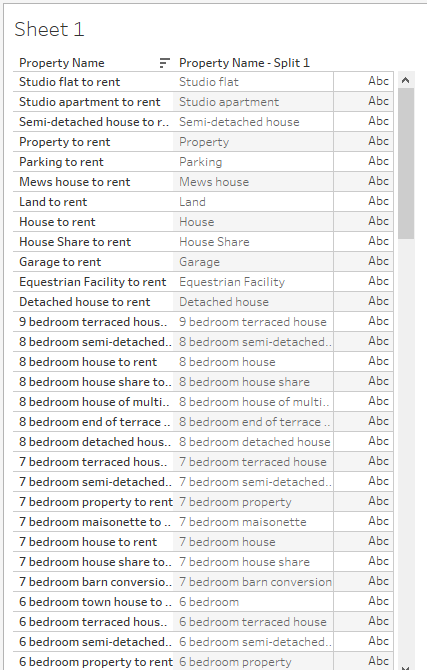 And also I'd have to spend a half of time translating everything into English so for this exercise I took Brighton and Hove data from http://rightmove.co.uk and got a nice JSON Lines file. JSON Lines files are basically the same JSON as we all know but every file has multiple JSONs delimited by a newline. That could be a real problem but luckily Tableau introduced JSON support in Tableau 10.1 and that means I don't have to transform my data to a set of flat tables. 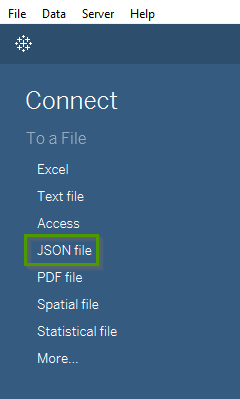 Thanks to Tableau developers we may simply open JSON Lines files without any transformations. Letting information - this part is more or less standard and has only a small number of possible values. This part has Property name: Property value structure ('Date available':'Now'). Key features - this part is an unformalized set of features. Every property may have its own unique features. 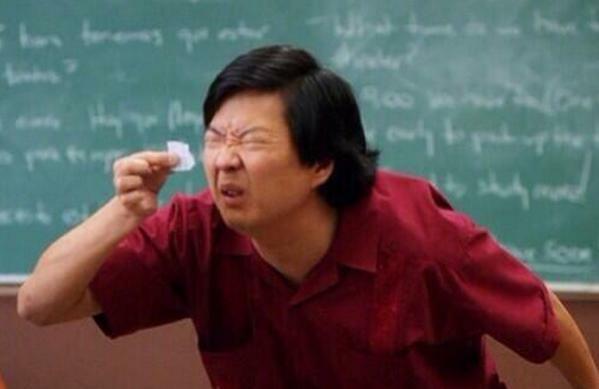 And it is not a key-value list like Letting information, but a simple list of features. Full description - simply a block of unstructured text. Nearest stations - shows three nearest train stations (there could be underground stations too if they had it in Brighton). School checker - this shows 10 closest primary and 10 secondary schools. 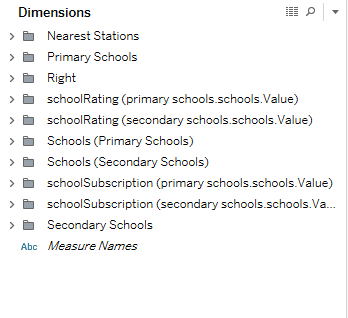 For this, I found a kind of API which brought me a detailed description of every school. And finally, the JSON for one property has the following look. In reality, it is one line but just to make it more easy to read I formatted it to a human readable format. And also I deleted most of the schools' info as it is not as important as it is huge. "TO ARRANGE A VIEWING PLEASE CONTACT US ON 01243 839149"
The full version is here: 6391 lines, I warned you. My dataset is relatively small and has 1114 of such records 117 MB in total. And it's possible or even likely that some of my conclusions may be obvious for anyone who is deep in the topic. 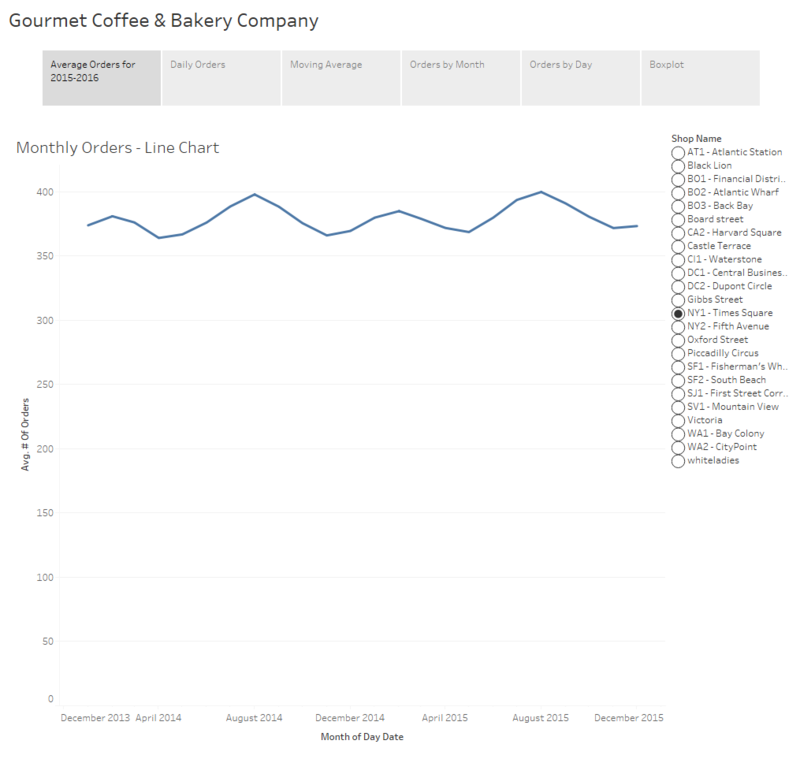 In this blog, I show how a complete newbie (me) can use Tableau and become less ignorant. So my very first task was to understand what kind of objects are available for rent, what are their prices and so on. That is the typical task for any new subject area. 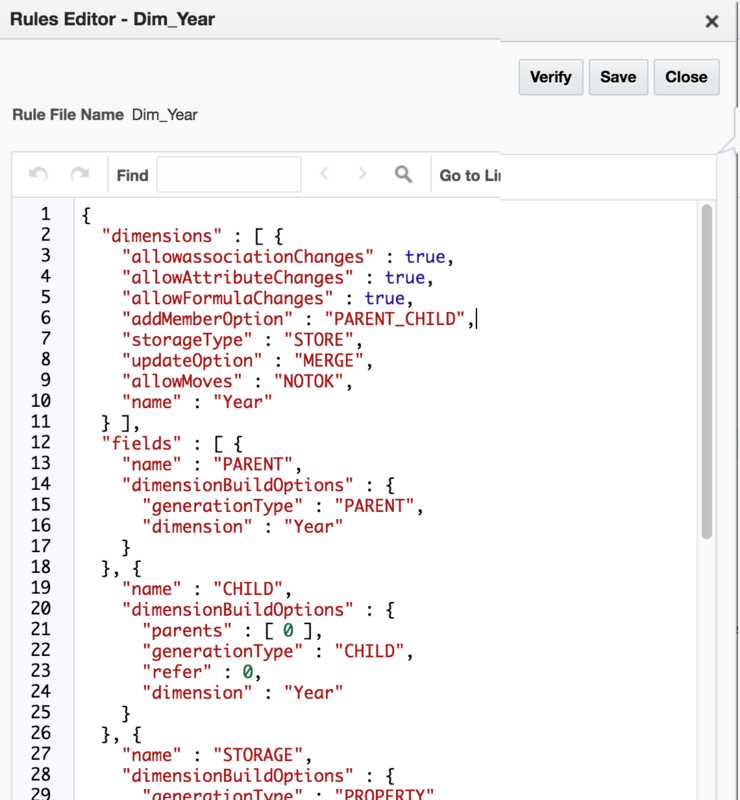 As I said before Tableau 10 can work with JSON files natively but the question was if it could work with such a complex JSON as I had. I started a new project and opened my JSON file. I expected that I will have to somehow simplify it. But in reality after a few seconds of waiting Tableau displayed a full structure of my JSON and all I had to do was selecting branches I need. After a few more seconds I got a normal Tableau data source. OK, let's get started. The first question is obvious: "What types of property are available for rent?". Well, it seems that name ('2 bedroom apartment to rent') is what I need. I created a table report for this field. Well, it gives me the first impression of what objects are offered and what my next step should be. First of all the names are ending with "to rent". This just makes strings longer without adding any value. The word "bedroom" also doesn't look important. 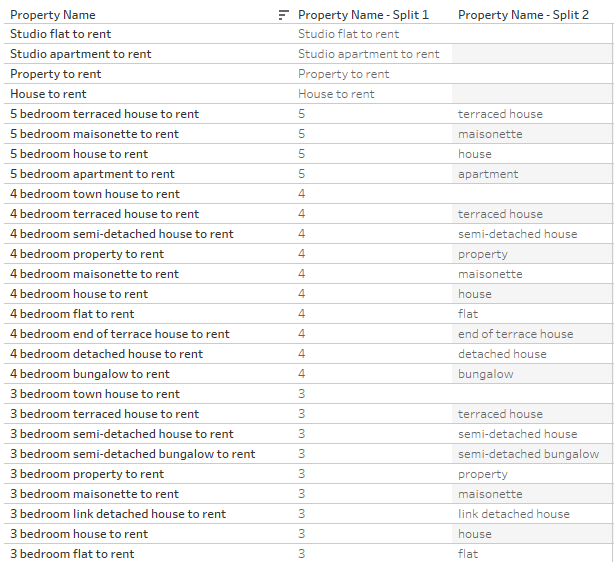 Ideally, I'd like to parse these strings into fields one of which is # of bedrooms and the second one is Property type. The most obvious action is to try Split function. But I spent 15 seconds for this and lost nothing and if it worked I'd saved a lot of time. Anyway, I'm too old to believe in magic and this almost didn't hurt my feelings. Yes, this string literally asks some regular expressions wizardry. I can easily use REGEXP_EXTRACT_NTH and get what I want. Group 1 is the number of bedrooms and Group 3 is the property type. Groups 2 and 4 are just constant words. Regular expressions are one of my favourite hammers and helped me a lot for this analysis. And after all manipulations, I got a much better view of the data (I skipped some obvious steps like create a crosstab or a count distinct measure to save space for anything more interesting). And while this result looks pretty simple it gives me the first insight I can't get simply browsing the site. The most offered are 1 and 2 bedroom properties especially flats and apartments. And if a family needs a bigger something with 4 or 5 bedrooms, well I wish them good luck, not many offers to chose from. Also if we talk about living property only we should filter out things like GARAGE, PARKING or LAND. I think both charts work pretty well. 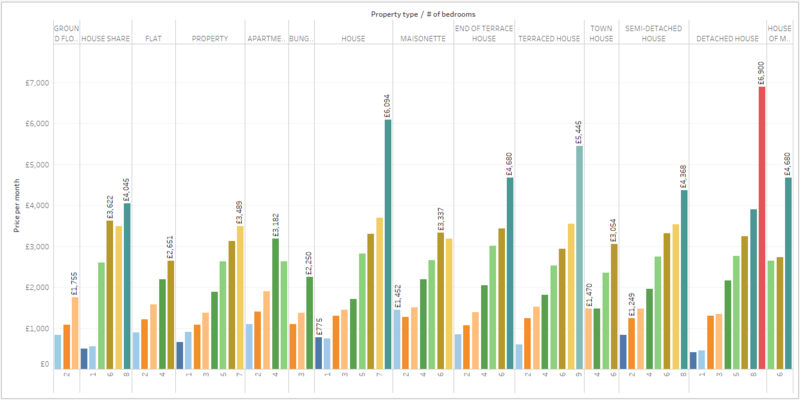 The first one presents a nice view of how flats and apartments outnumber all other types and the second one gives a much better understanding of how many of 2 bedroom properties offered compared to all others. And while I'm not a big fan of fancy visualisations but if you need something less formal and more eye-catching try Bubbles chart. It's not something I'd recommend for an analysis but may work well for a presentation. 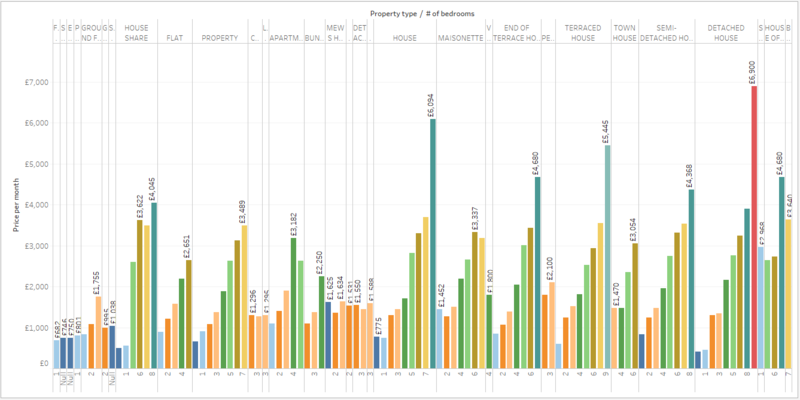 Every bubble represents particular property type, colour shows a number of bedrooms and size shows the number of properties. The next obvious question is the price. How much do different properties cost? Is any particular one more expensive than average or less? What influences the price? As a baseline, I'd like to know what is the average property price. And I obviously don't want just one figure for the city-wide price. It's meaningless. 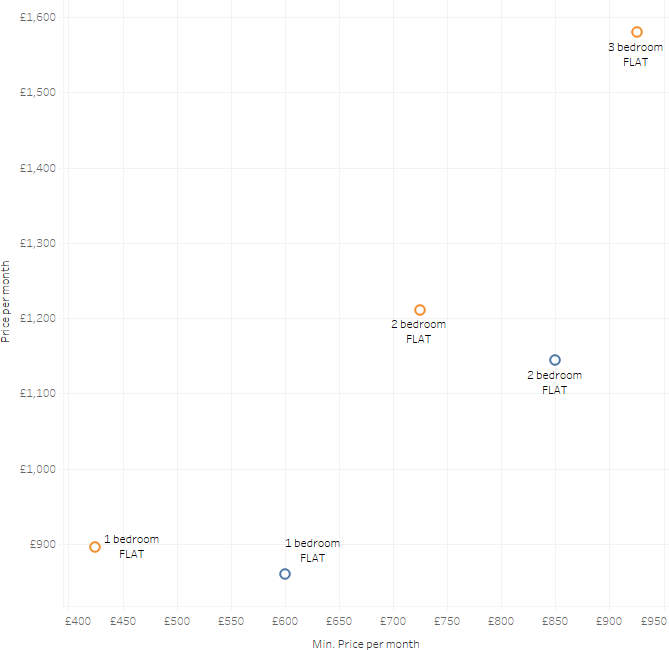 Let's start with a bar chart and see what is the range of prices. Well, we have a lot of options. Flat share costs less than £700 or we may choose a barn for more than £3600. Again a very simple result but I can't get it directly from the site. The next obvious question is how the number of bedrooms affects the price. Does the price skyrockets with every additional bedroom or maybe more bedrooms mean smaller rooms and price increases not too fast? Well, this chart gives me the answer but it looks bad. Mostly because a lot of properties types don't have enough variance in room number. Studio flats have only one bedroom by definition and the only converted barn has 7 bedrooms. I'd like to remove types which don't have at least 3 options and see how the price changes. For this, I created a new computed field using fixed keyword. It counts the number of bedroom options by property type. And then I use it in the filter 'Bedroom # variance' at least 3. Now I have a much more clean view. And I can see that typically more bedrooms mean significantly higher price with a few exceptions. But in fact, these are not actual exceptions just a problem of a small dataset. I can say that increase in # bedrooms certainly means a significant increase in price. And one more insight. Going above 7 bedrooms may actually double the price. Averages are good but they hide important information of how prices are distributed. For example, six properties priced £1K and one £200 give average £885. And looking at average only may make you think that with £900 you may choose one of 7 options. It's very easy to build a chart to check this. 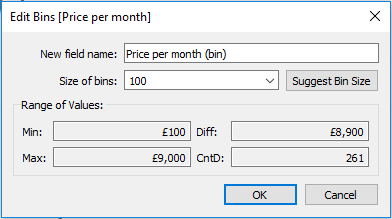 Just create a new calculation called Bins and use in a chart. With £100 bins I got the following chart. 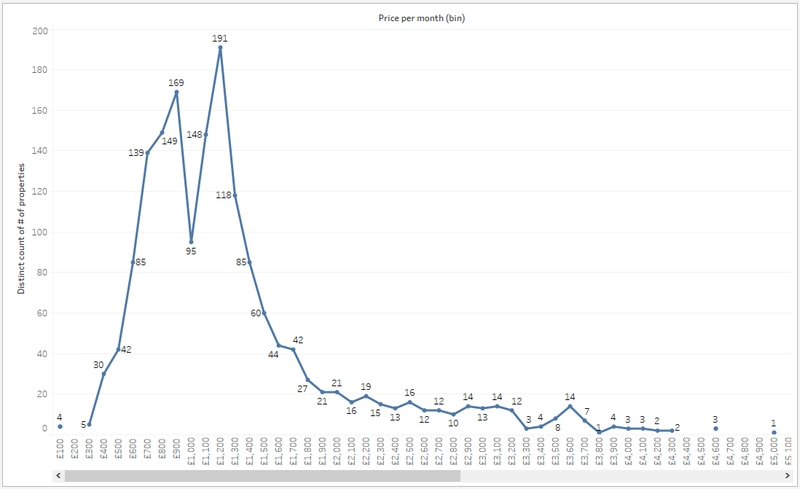 It shows how many properties have price falling to a particular price range. 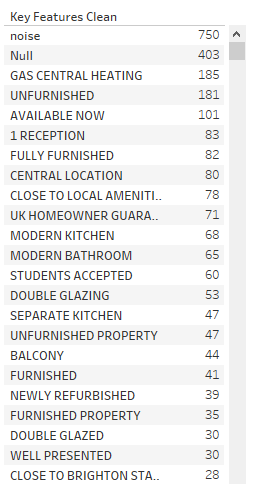 For example, the £1000 bin shows # of properties with prices £1000-£1100. The distribution looks more or less as expected but the most interesting here is that £1000-£1100 interval seems to be very unpopular. Why? Let's add # of bedrooms to this chart. £1000 is too expensive for 1 bedroom and studios but too cheap for two. Simple. What else can we do here before moving further? Converting this chart to a running total gives a cool view. What can this chart tell us? For example, if we look at the orange line (2 bedrooms) we will find that with £1200 we may choose among 277 of 624 properties. With £1400 budget we have 486 of 624. Further £200 increase in budget won't significantly increase the number of possibilities and if the change from £1200 to £1400 almost doubled the number of possibilities, the next £200 give only 63 new options. I don't have a ready to use insight here, but I got a way to estimate a budget for a particular type of property. With budget £X I will be able to choose one of N properties. OK, now I know a lot of statistics about prices. And my next question is about factors affecting the price. I'd like to understand does a particular property worth what it cost or not. Of course, I won't be able to determine exact price but even hints may be useful. The first hypothesis I want to check is if a train station near raises the price or it isn't any important. I made a chart very similar to the previous one and it seems that Pareto principle works perfectly here. 80% or properties are closer than 20% of the maximum distance to a station. But this chart doesn't say anything about the price it just gives me the understanding of how dense train stations are placed. I'd say that most of the properties have a station in 10-15 minutes of walking reach and therefore this should not significantly affect the price. 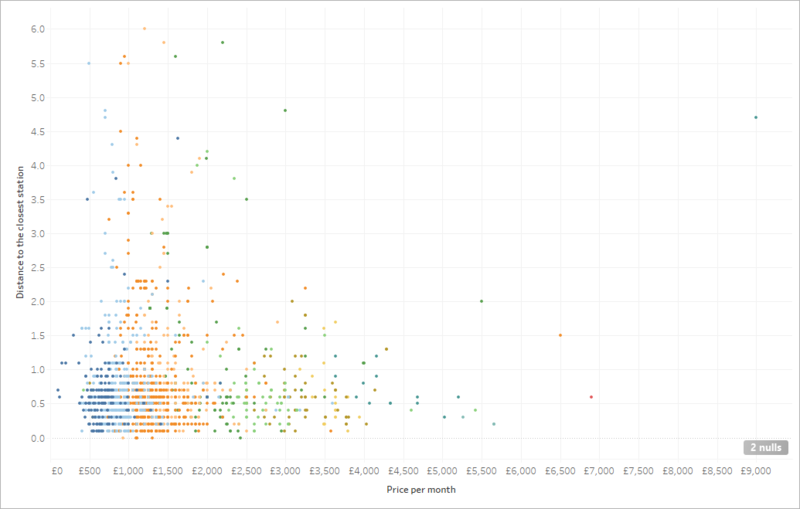 My next chart is a scatter plot for price and distance. Every point is a property and its coordinates on the plot determined by its price and distance to the nearest station. 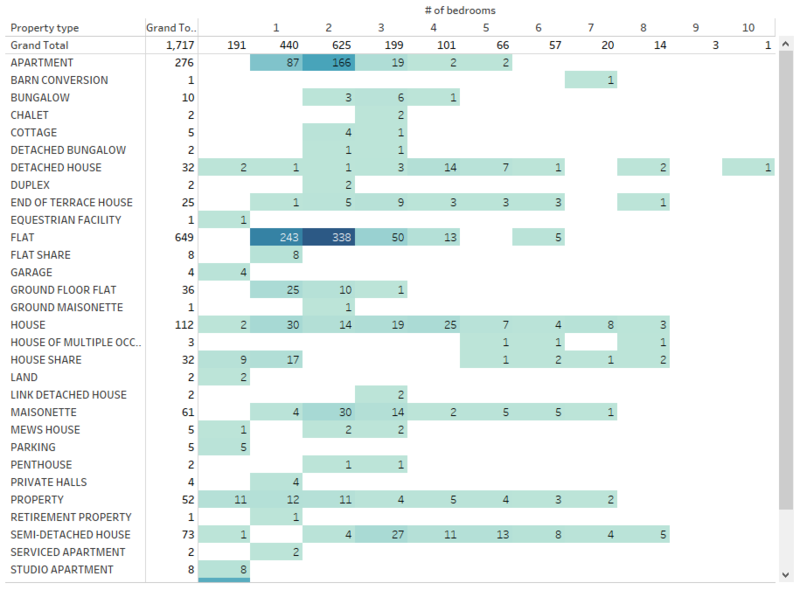 Colour shows # of bedrooms. I'd say that this chart shows no clear correlation between price and distance. And a more classical line chart shows that. The maximum price slightly decreases with distance, minimum price on the contrary increases. Average price more or less constant. I think the hypothesis is busted. 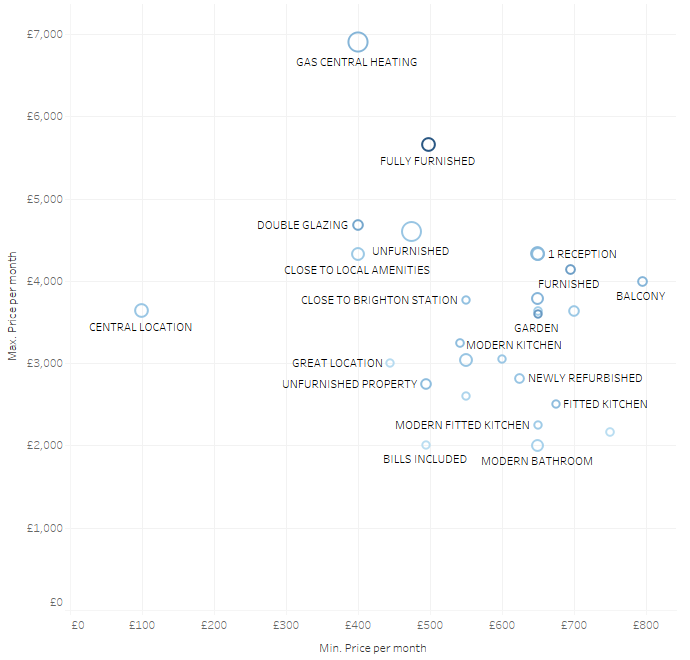 There is no clear correlation between the distance a tenant have to walk to a station and the price he has to pay. If you want to rent something and the landlord says that the price is high because of a train station near, tell him that there are stations all around and he should find something more interesting. What about furnishings? Does it cheaper to get an unfurnished property or a landlord will be happy to meet someone who shares his taste? Unfurnished property is definitely cheaper. And it's interesting that in some cases partly furnished even cheaper than completely unfurnished. But at least for furnished/unfurnished, we can see a clear correlation. When you see a furnished one for the price of unfurnished this may be a good pennyworth. Another thing I'd like to check. Can we expect I lower price for a property not available immediately? Or is, on the contrary, the best price is offered for already unoccupied properties? As always start with a general picture. What is the average time of availability by property types? For most popular types it is about one month and if you have a house you typically publish it two or three months in advance. And what is about the price? 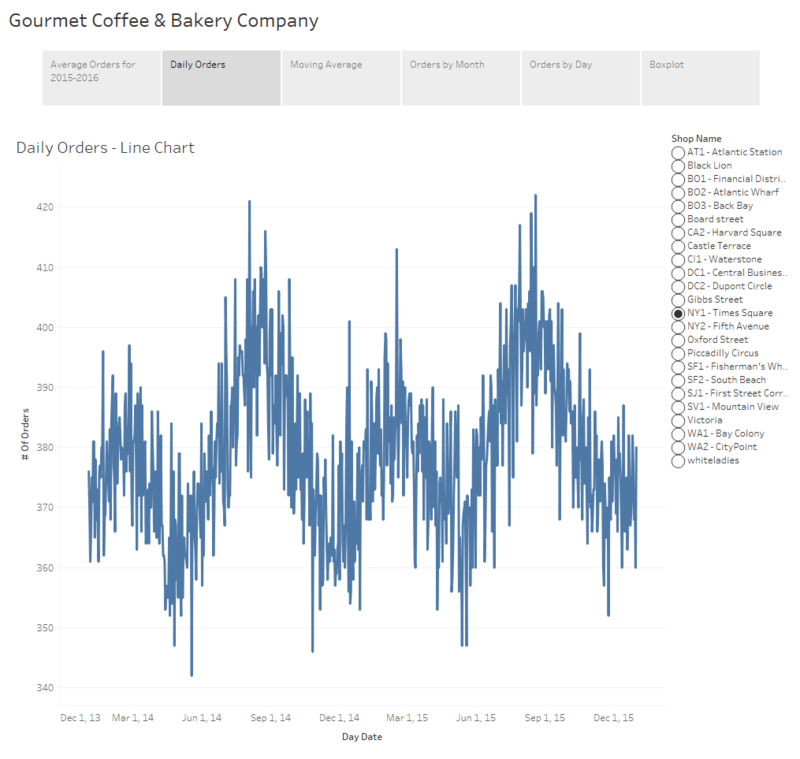 One more chart that I like in Tableau. 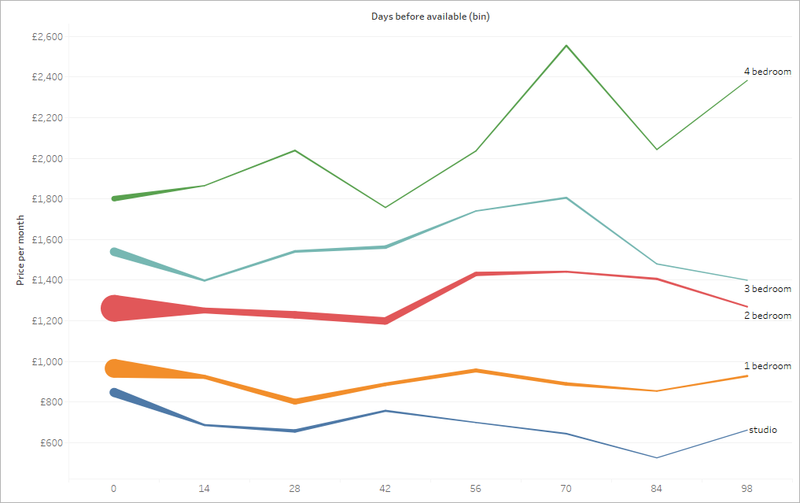 In the nutshell, it is a normal line chart showing an average price by days before property availability. But the thickness of lines shows the number of properties at the same time. So I can see not only the price but reliance too. A thick line means it was formed by many properties and a thin line may be formed by few properties and move up or down significantly then something changes. 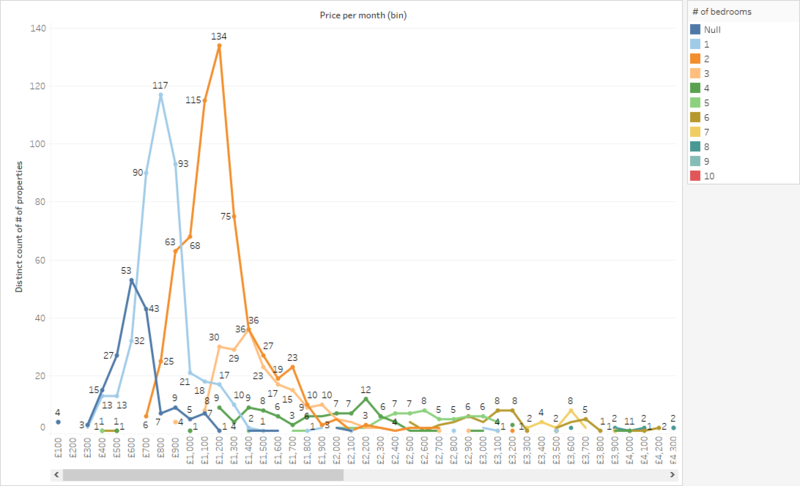 It would be very interesting to get a historical data and see how much time properties stay free or how long it takes before the price is reduced, but unfortunately, I don't have this data. 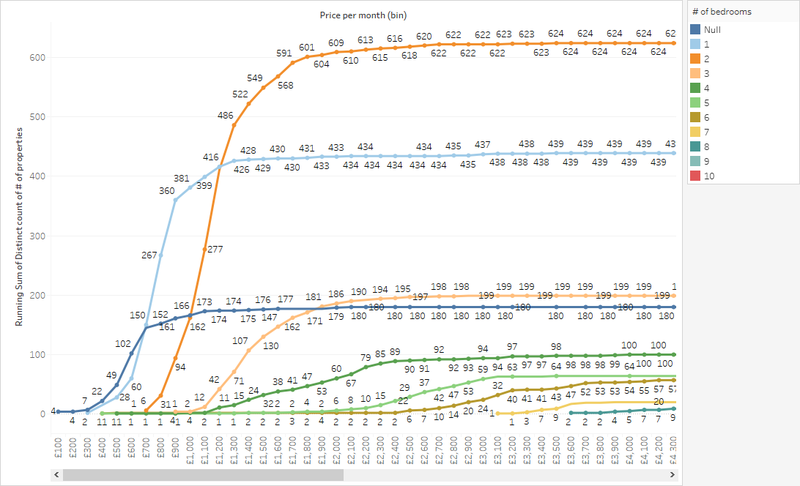 And looking at this chart I'd say that there is no statistically significant dependency for price and availability date. Renting a property available in the distant future won't save you money* (*=statistically). And the last thing I'd like to investigate is the Key features. What do landlords put as the key features of their properties? How do they affect the price? The list of popular Key features surprised me. 'Unfurnished' looks good to me, it is a really significant part of the deal. But 'Brighton'? 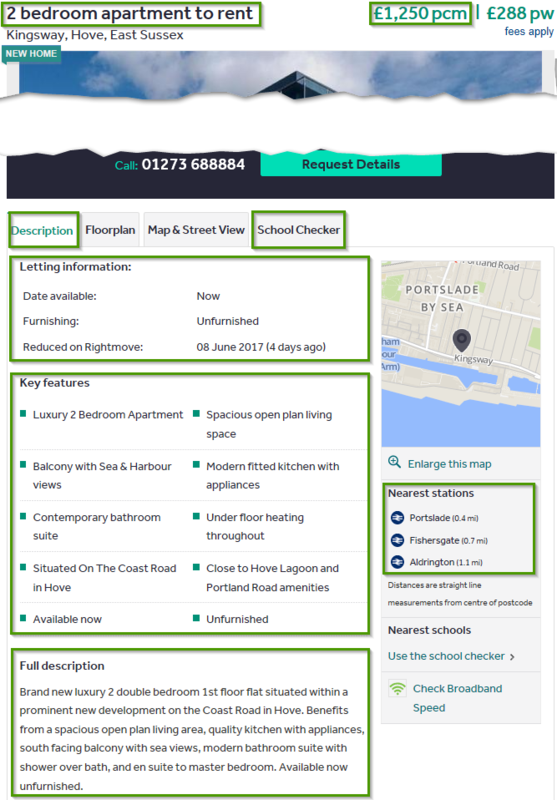 For properties in Brighton? '1 Bedroom'. How many bedrooms can '1 bedroom flat to rent' have? Oh, there is a key feature saying '1 bedroom' now I know. But jokes aside. I had to make a lot of cleaning on this data before I could use it. There are six ways to write 'Modern kitchen'. 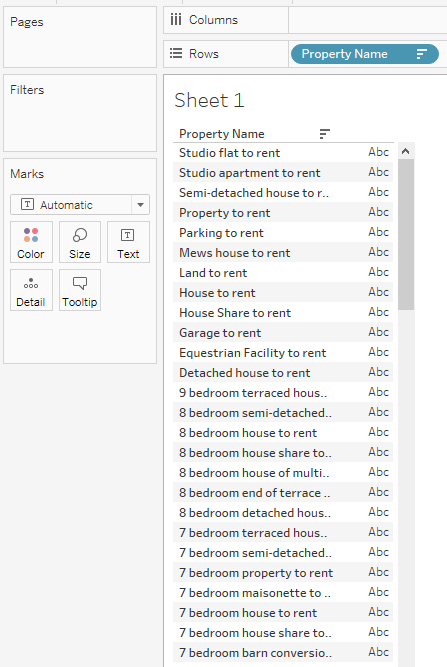 Make everything upper case, then remove quotes, strip spaces and tabs, remove noisy features like 'stylish 1 bedroom apartment' and so on. After this, I got a slightly better list with approximately 3500 features instead of 4500. Note how all variants of writing 'GAS CENTRAL HEATING' now combined into one most popular feature. But there are still too many features. I'm sure that there should be not more than a hundred of them. Even at this screenshot you may see 'Unfurnished' and 'Unfurnished property' features. When I need a visualisation for this amount of points, bar charts or tables won't play well. My weapon of choice is Scatter plot. Every point is a particular feature, axes are minimum and average prices of it, size is determined by the number of properties declaring to have this feature and the colour is the maximum price. So if a feature is located high on the plot it means that in average it will be expensive to have it. If this feature at the same time located close to the left side even cheap properties may have it. 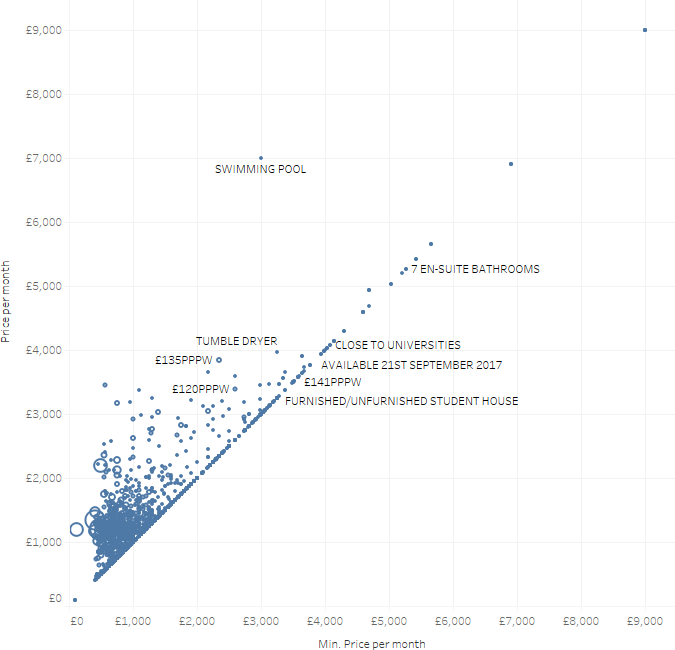 For example, if you want a swimming pool be ready to pay at least £3000 and £7000 in average. And the minimum price for tumble dryer is £3250 but average £3965. The cheapest property with a dryer is more expensive than with a pool, but in average pools are more expensive. That is how this chart works. The problems of this chart are obvious. It is littered with unique features. Only one property has 4 acres (the point in top right corner). And actually not so many swimming pools are available for rent in Brighton. 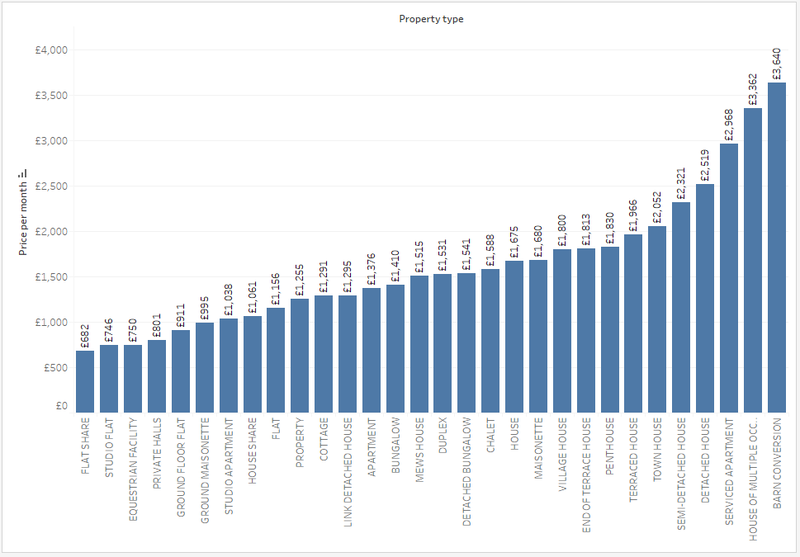 I filtered it by "# of properties > 25" and here is how prices for the most popular features are distributed. Central location will cost you at least £100 and £1195 in average and for Great location be ready to pay at least £445 and £1013 in average. Great location seems to be less valuable than the central one. And now I can see how a particular feature impacts prices. For example 'GAS HEATING'. I made a set with all variants of heating I could find ('GAS CENTRAL HEATING', 'GAS HEAT' and so on). Now I can analyse how this feature impacts properties. And here is how it impacts the price of flats. Blue circles are properties with gas heating and orange are without. Very interesting in my opinion. The minimum price of properties with gas heating (blue circles) is higher than without. That is expected. But average price for properties without gas heating is higher. And here are kitchen appliances. 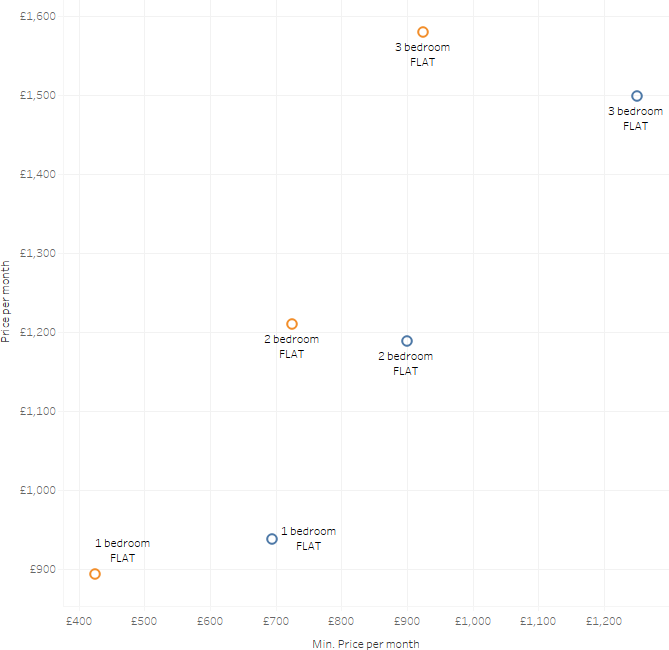 For 1 bedroom flats, they increase both minimum and average prices significantly. But for bigger flats minimum price with appliances is higher and average price is lower. Possible this option is important for relatively cheap properties, but its weight is not that big for the bigger ones. 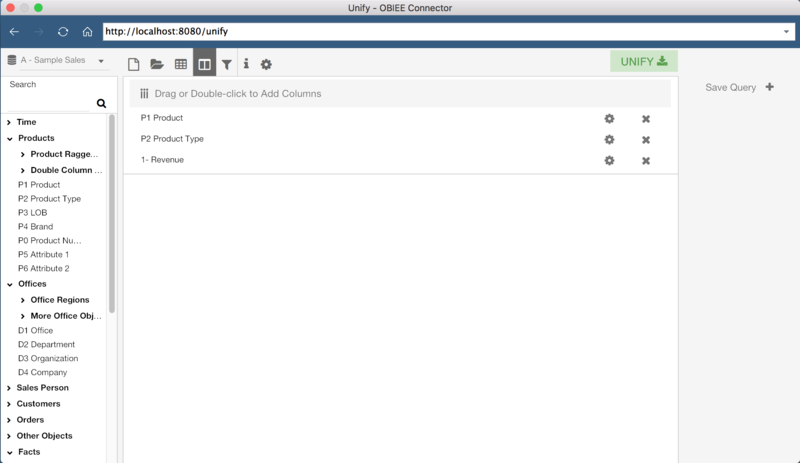 Monday, 12 Jun saw the official release of Unify, Rittman Mead's very own connector between Tableau and OBIEE. It provides a simple but powerful integration between the two applications that allows you to execute queries through OBIEE and manipulate and render the datasets using Tableau. One of the first questions of course would be why we would want to do this in the first place. The excellent thing about OBI is that it acts as an abstraction layer on top of a database, allowing analysts to write efficient and secure reports without going into the detail of writing queries. As with any abstraction, it is a trade of simplicity for capability. Products like Tableau and Data Visualiser seek to reverse this trade, putting the power back in the hands of the report builder. However, without quoting Spiderman, care should be taken when doing this. The result can be that users write inefficient queries, or worse still, incorrect ones. We know there will be some out there that use self service tools as purely a visualisation engine, simply dropping pre-made datasets into it. If you are looking to produce sustainable, scalable and accessible reporting systems, you need to tackle the problem both at the data acquisition stage as well as the communication stage at the end. If you are already meeting both requirements, perhaps by using OBI with Data Visualiser (formerly Visual Analyser) or by other means then that's perfectly good. However, We know from experience that there are many of you out there that have already invested heavily into both OBI and Tableau as separate solutions. Rather than have them linger in a state of conflict, we'd rather we nurse them into a state of symbiosis. 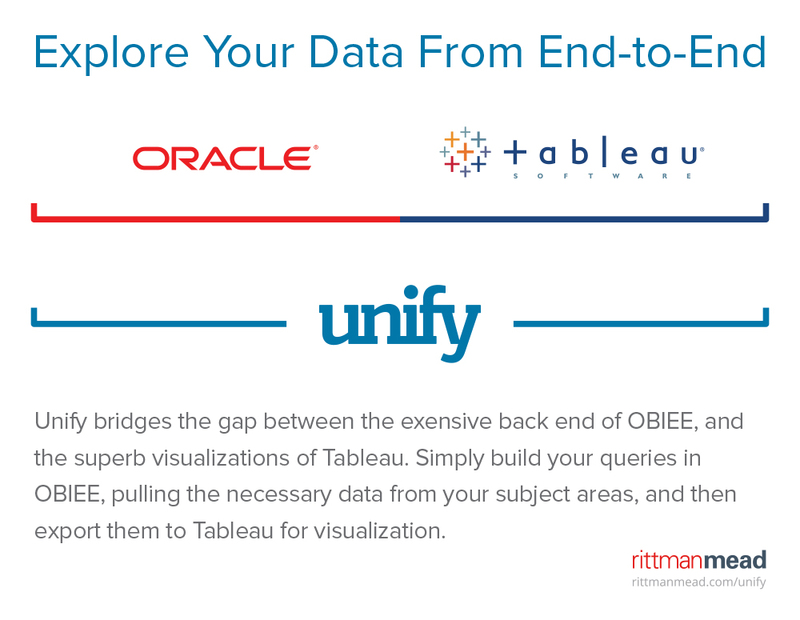 The idea behind Unify is that it bridges this gap, allowing you to use your OBIEE system as an efficient data acquisition platform and Tableau as an intuitive playground for users who want to do a a bit more with their data. 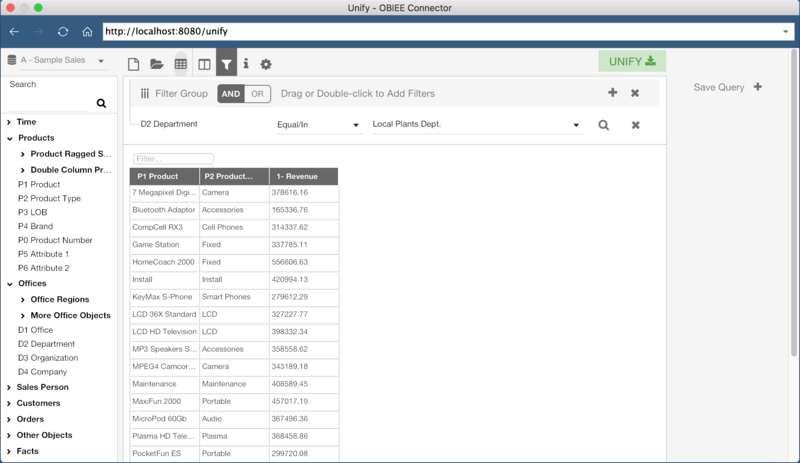 Unify works by using the Tableau Web Data Connector as a data source and then our customised software to act as an interface for creating OBIEE queries and them exporting them into Tableau. 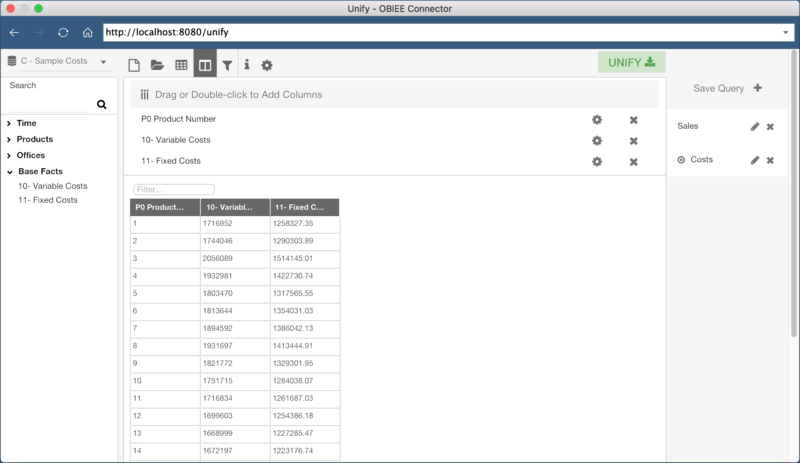 Unify uses Tableau's latest Web Data Connector data source to allow us to dynamically query OBIEE and extract data into Tableau. Once a dataset is extracted into Tableau, it can be used with Tableau as normal, taking advantages of all of the powerful features of Tableau. This native integration means you can add in OBIEE data sources just as you would add in any others - Excel files, SQL results etc. 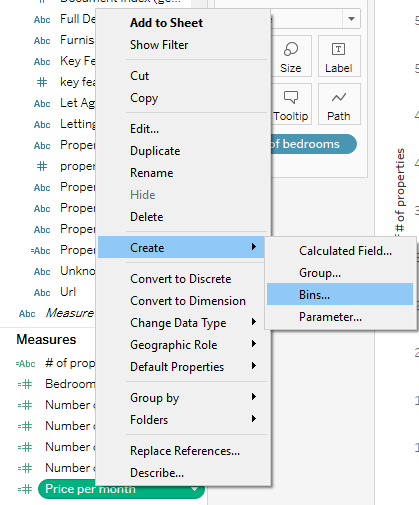 Then you can join the data sources using Tableau itself, even if the data sources don't join up together in the background. Then give the link to the Unify application, e.g. http://localhost:8080/unify. 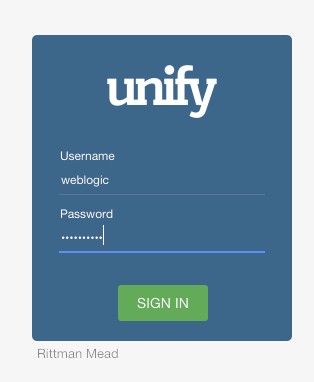 This will open up Unify and prompt you to login with your OBIEE credentials. This is important as Unify operates through the OBIEE server layer in order to maintain all security permissions that you've already defined. 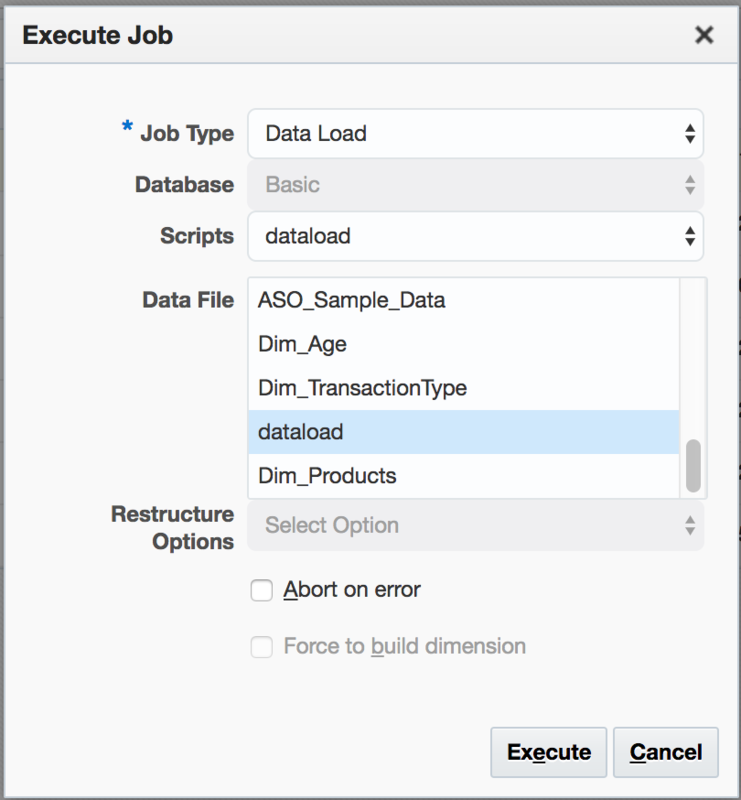 Now that the application is open, you can make OBIEE queries using the interface provided. This is a bit like Answers and allows you to query from any of your available subject areas and presentation columns. The interface also allows you to use filtering, column formulae and OBIEE variables much in the same way as Answers does. Alternatively, you can open up an existing report that you've made in OBIEE and then edit it at your leisure. Unify will display a preview of the dataset so you can tweak it until you are happy that is what you want to bring into Tableau. 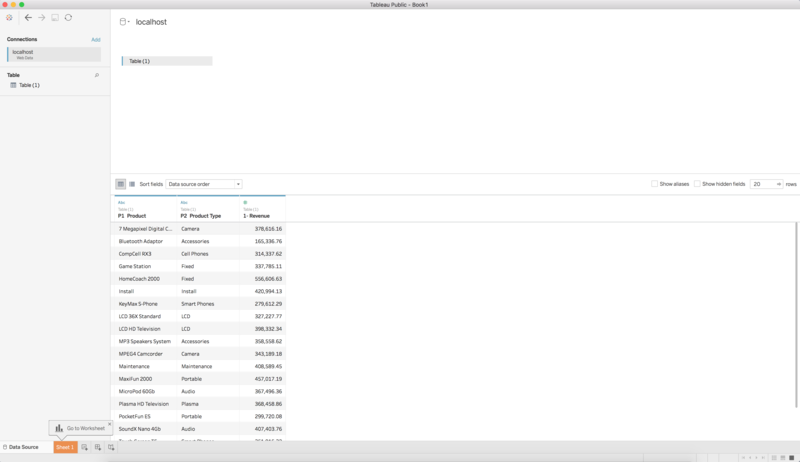 Once you're happy with your dataset, click the Unify button in the top right and it will export the data into Tableau. From this point, it behaves exactly as Tableau does with any other data set. This means you can join your OBIEE dataset to external sources, or bring in queries from multiple subject areas from OBIEE and join them in Tableau. 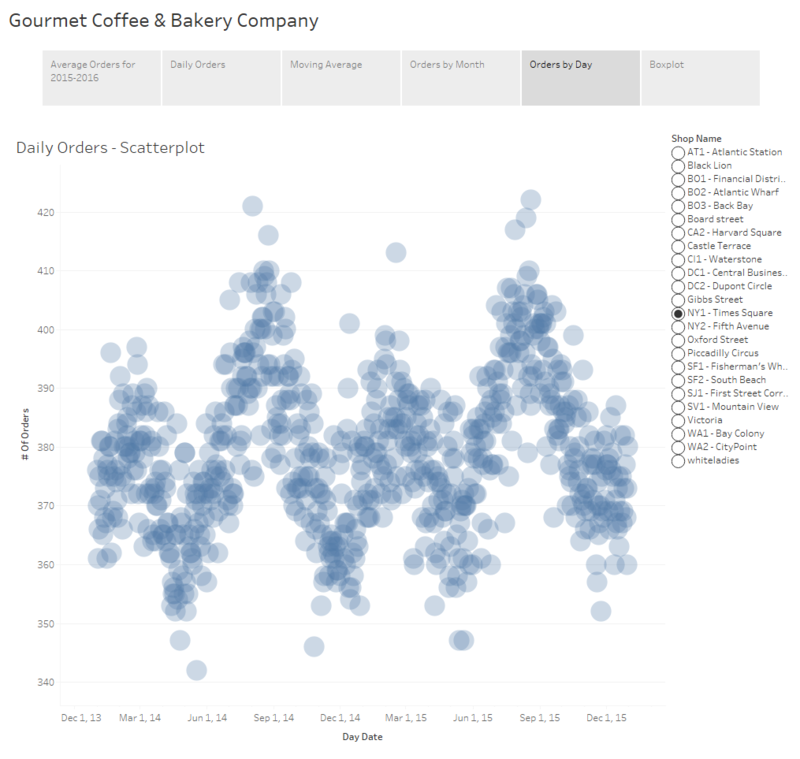 Then of course, take advantage of Tableau's powerful and interactive visualisation engine. 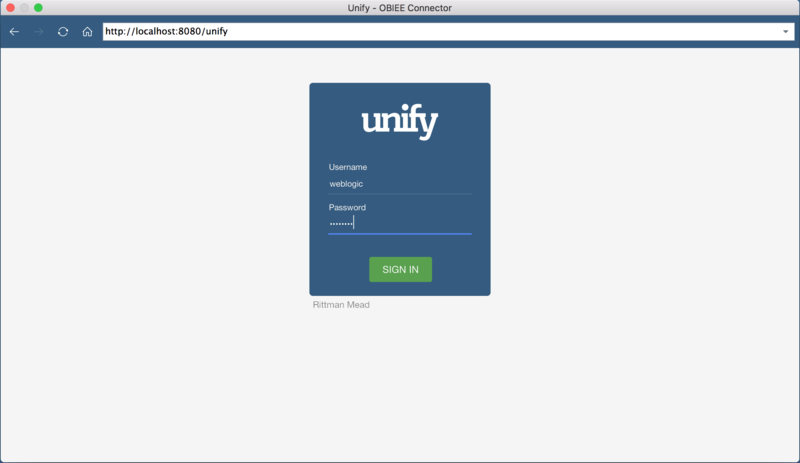 Unify comes in desktop and server flavours. The main difference between the two is that the server version allows you to upload Tableau workbooks with OBIEE data to Tableau Server and refresh them. 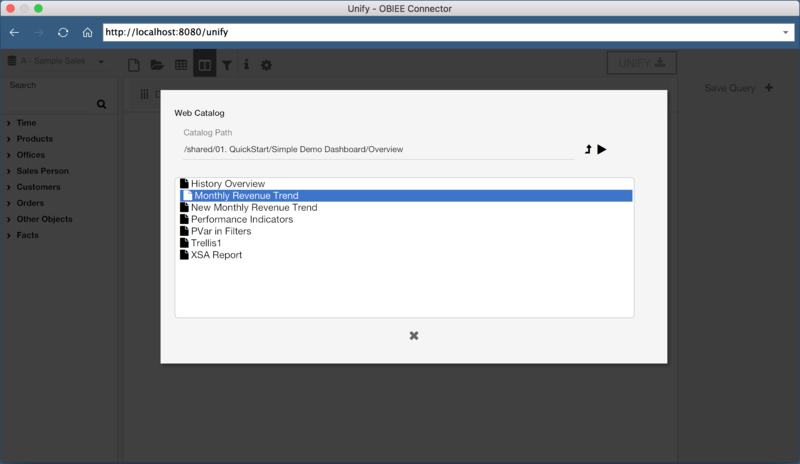 With the desktop version, you will only be able to upload static workbooks that you've created, however with the server version of Unify, you can tell Tableau Server to refresh data from OBIEE in accordance with a schedule. This lets you produce production quality dashboards for your users, sourcing data from OBIEE as a well as any other source you choose. In a nutshell, Unify allows you to combine the best aspects of two very powerful BI tools and will prevent the need for building all of your reporting artefacts from scratch if you already have a good, working system. 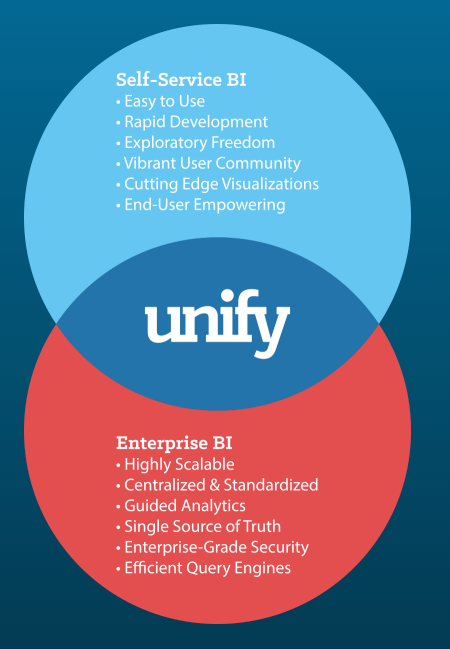 I hope you've found this brief introduction to Unify informative and if you have OBIEE and would like to try it with Tableau, I encourage you to register for a free desktop trial. If you have any questions, please don't hesitate to get in touch. Ad hoc access to accurate and secured data has always been the goal of business intelligence platforms. Yet, most fall short of balancing the needs of business users with the concerns of IT. Rittman Mead has worked with hundreds of organizations representing all points on the spectrum between agility and governance. 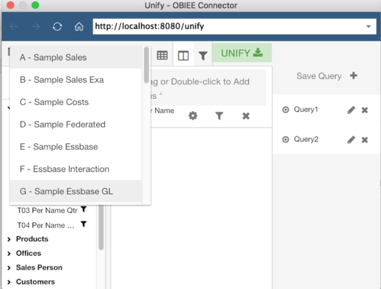 Today we're excited to announce our new product, Unify, which allows Tableau users to directly connect to OBIEE, providing the best of both worlds. 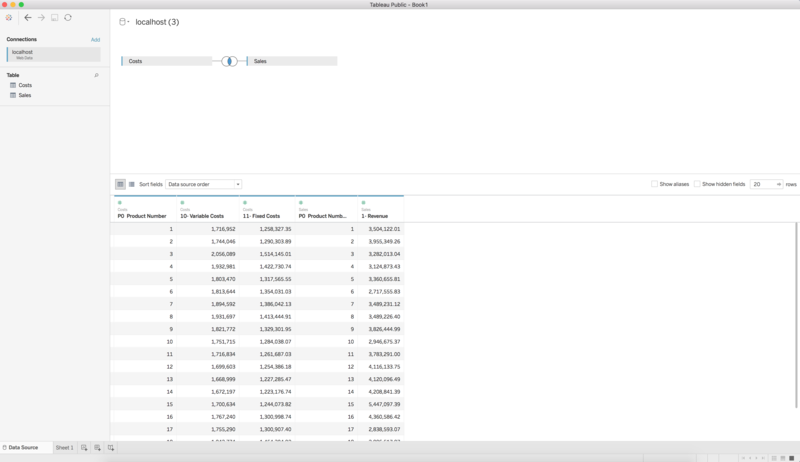 Business users get Tableau's intuitive data discovery features and the agility they need to easily blend their departmental data without waiting on IT to incorporate it into a warehouse. IT gets peace of mind, knowing their mission-critical data is protected by OBIEE's semantic layer and row-level security. 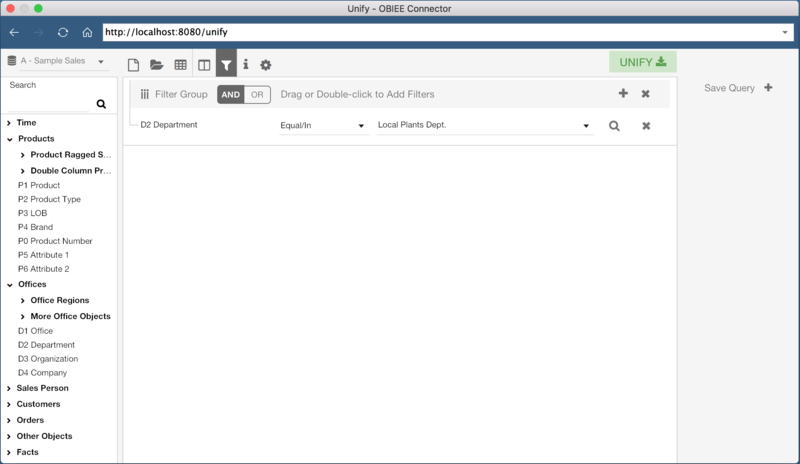 Unify runs as a desktop app, making it easy for departmental Tableau users to connect to a central OBIEE server. 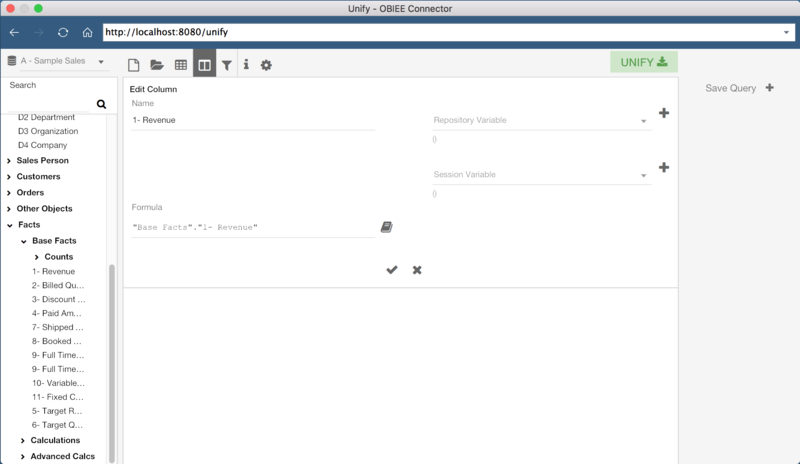 Unify also has a server option that runs alongside OBIEE, for organizations with a large Tableau user base or those using Tableau Server. Desktop installation and configuration is simple. 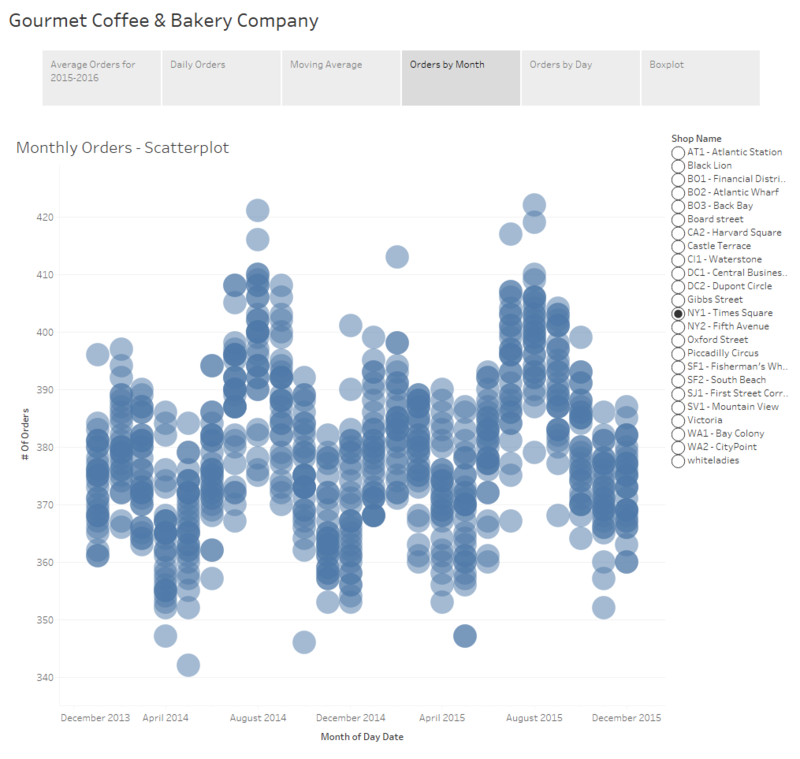 Once installed, users can query OBIEE from within Tableau with just a few clicks. Have a look at these short videos demonstrating setup and use of Unify. Download your free 7-day trial of Unify Desktop here. No Tableau Desktop license? No problem. 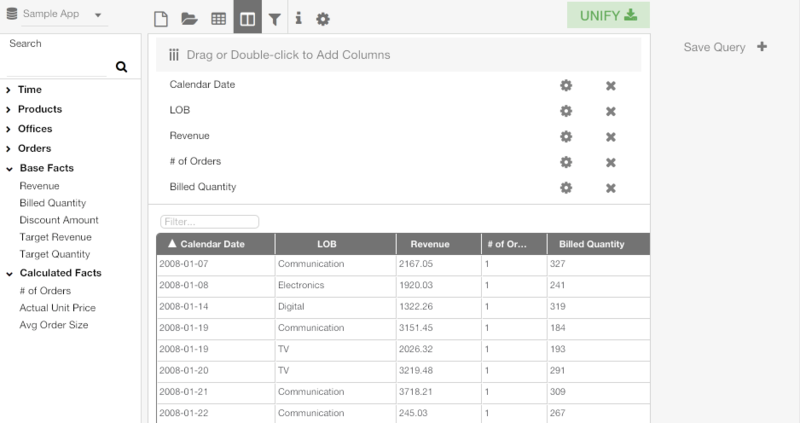 Unify is compatible with Tableau Public. Finally managed to get around to having a proper look at Essbase within Oracle Analytics Cloud Service (OAC) after a busy couple of months. This post focusses mainly on initial impressions on the ‘out of the box’ the Essbase side of this - which we will explore in more detail in future posts, as well as more detail on the use of Essbase with DVCS. One of the features we are keen to explore more in this context is the integration of Essbase and the Data Visualisation Cloud Service (DVCS). 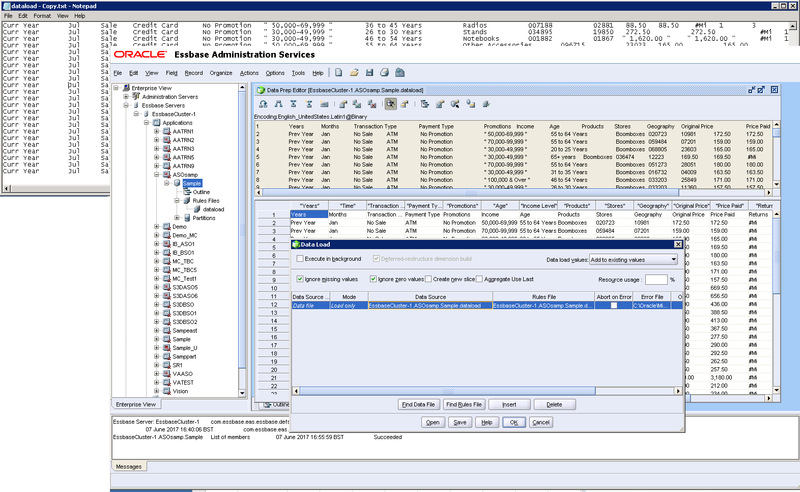 One point that we found that we do not think is being expressed clearly anywhere else we have seen is how to configure this: In setting up our OAC instance, we were having difficulty coming up with a combination of configuration selections that enables Essbase and DV to work at the same time. But Doc ID 2265410.1 on MoS suggests, by needing to add a security rule to the Essbase OAC, that two OAC instances are required. We could not find any reference to this requirement in Oracle documentation or blogs on the subject, but it transpires after checking with Oracle that this is indeed the case – Essbase and DV need to be on separate OAC instances. Looking purely at Essbase, my initial reaction is very positive…whilst the interface is different (I am sure tears will be shed for EAS & Studio in the foreseeable future…although given the way some stalwarts are still clinging on the last surviving copies of the Excel Add In, maybe not too imminently), once the surface of the new interface is scratched more...ahem…’seasoned’ developers will take comfort from being able to do a lot of the same things as they currently can. I am also confident it will fulfil one of the stated objectives in making it easier for non-experts to be able quickly and easily deploy cubes for analysis purposes. Whilst the manual application and cube maintenance tools through the OAC front-end seem resilient and work effectively, I think some aspects will be difficult to use as the primary maintenance method in a production system - the ‘breadcrumb’ method afforded to dimension maintenance in particular will start to get fiddly to use with a dimension of any sort of volume. 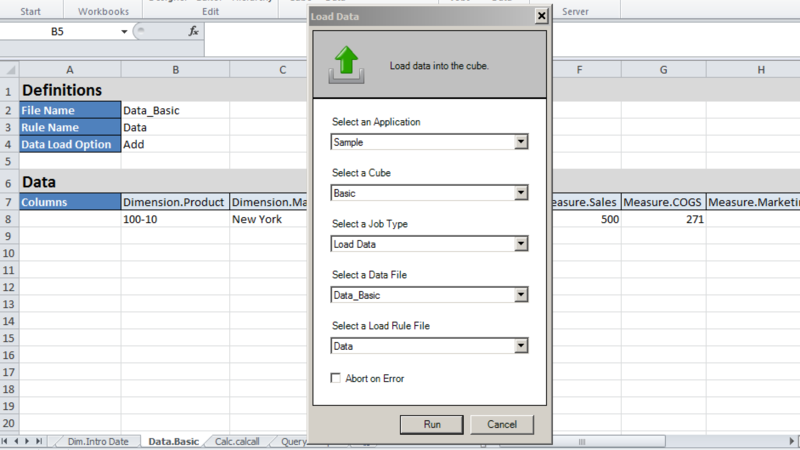 The application and cube Import (from a formatted Excel spreadsheet) facility is great - to my mind, a bit like a supercharged and easier-to-use Outline Load Utility in Hyperion Planning - and the ability to refresh the spreadsheet from a deployed cube is a good feature that shouldn’t have been taken for granted. I know Excel is regarded as the Devil’s work in some BI quarters…I personally don’t feel that way until it is being used as a database (or as some form of primary data storage)…but in this context, it is quick & easy to use, on most people’s desktops straightway, and is intuitive. Still in the Excel corner, on the Smartview side, the addition of the Cube Designer extension (requiring Smartview 11.1.2.5.700) to be able to consider & change the more generic aspects (not members) of the ‘cube maintenance’ spreadsheets is a nice touch that makes this more straightforward and removes the need to pay strict attention to the spreadsheet layout. The ‘treeview’ style hierarchy viewer also helps make sense of the parent-child members that need to be detailed on the individual dimension tabs. I’m not too sure how many people have created or edited rules files like this before (although I’d hazard a guess), but whilst the presence of any means to create, amend, or even tweak a file is good, it remains to be seen how usable this approach is. The alternative is to resubmit from the maintenance spreadsheet thus getting it created / amended for you or to maintain in on-prem system…but seeing as this platform is an alternative to (rather than an augmentation of) on prem for a lot of people, I’m not sure how practical this is. Whilst the existing tools look really promising, I can’t help but think there will be occasions going forwards where it might be advantageous to be able to create a rules file to run an uploaded file outside of them: time will tell. In conclusion, first impressions are very favourable. There are changes (eg Security), new features (eg Sandboxing), and I am sure there will be gaps for those considering moving from existing on-prem applications - for example, as I have seen someone else reference, there does not seem to be any reference to partitions in the front end or the import spreadsheet layout - so whilst there is a lot with which we will quite quickly feel familiar, there are also going to be new areas and new practices for us to get into step with: as above, we will look to explore some of these in future posts. Not long ago Oracle added a new offer to their Cloud - an OBIEE in a Cloud with full access. Francesco Tisiot made an overview of it and now it's time to go a bit deeper and see how you can poke it with a sharp stick by yourself. In this blog, I'll show how to get your own OAC instance as fast and easy as possible. You will need to verify your phone number by receiving an SMS. It seems that this mechanism may be a bit overloaded and I had to make more than one attempts. I press the Request code button but nothing happens. I wait and press it again, and again. And eventually, I got the code. I can't say for sure and possible it was just my bad luck but if you face the same problem just keep pushing (but not too much, requesting a code every second won't help you). Even for trial you'll be asked for a credit card details. I haven't found a good diagnostics on how much was already spent and the documentation is not really helpful here. 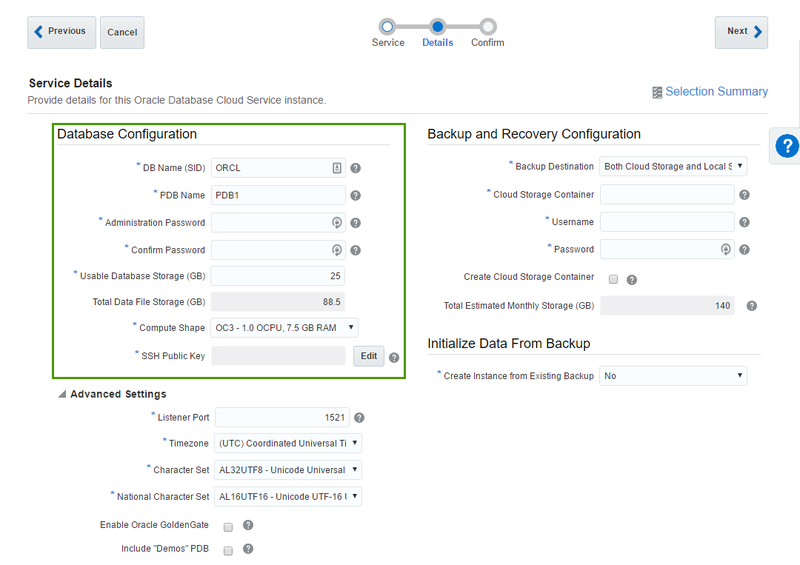 Oracle Cloud Storage (OCS) - is used for backups, log files, etc. 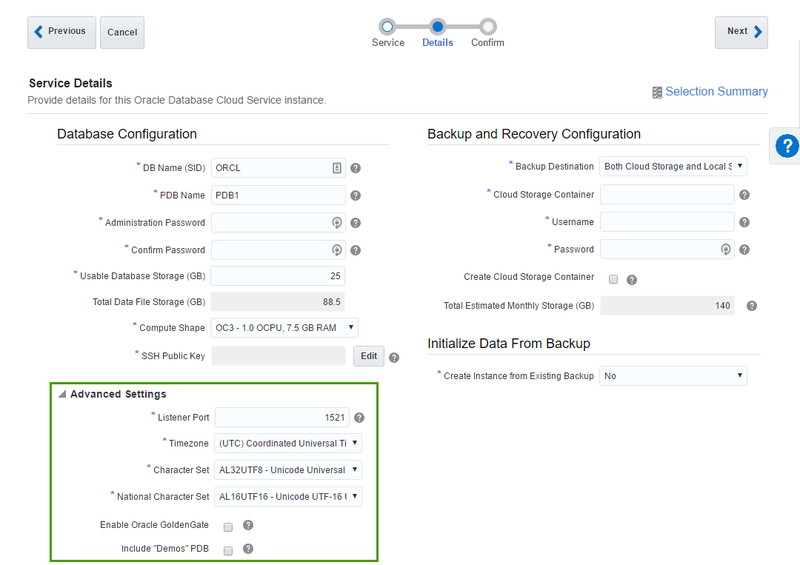 Oracle Cloud Database Instance (DBC) - is used for RCU schemas. Oracle Analytics Cloud Instance (OAC) - is our ultimate target. From the Cloud services point of view, architecture is the following. This picture doesn't show virtual disks mounted to instances. These disks consume Cloud Storage quota but they aren't created separately as services. We need at least one Oracle Database Cloud instance to store RCU schemas. This database may or may not have a separate Cloud Storage area for backups. Every OAC instance requires Cloud storage area for logs. Multiple OAC instances may share one Cloud storage area but I can't find any advantage of this approach over a separate area for every instance. We create these resource in the order they are listed earlier. Start with Storage, then DB and the last one is OAC. Actually, we don't have to create Cloud Storage containers separately as they may be created automatically. But I show it here to make things more clear without too much "it works by itself" magic. 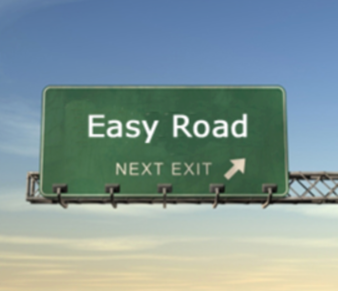 The easiest part of all is the Oracle Cloud Storage container. We don't need to specify its size or lots of parameters. All parameters are just a name, storage class (Standard/Archive) and encryption. I spent some time here trying to figure out how to reference this storage later. There is a hint saying that "Use the format: <storage service>-<identity domain>/<container>. For example: mystorage1-myid999/mybackupcontainer." And if identity domain and container are pretty obvious, storage service puzzled me for some time. The answer is "storage service=Storage". You can see this in the top of the page. It seems that Storage is a fixed keyword, rurittmanm is the domain name created during the registration process and demo is the actual container name. So in this sample when I need to reference my demo OCS I should write Storage-rurittmanm/demo. Now when we are somewhat experienced in Oracle Cloud we may move to a more complicated task and create a Cloud DB Instance. It is harder than Cloud Storage container but not too much. If you ever created an on-premise database service using DBCA, cloud DB should be a piece of cake to you. Oracle Database Cloud Service: Oracle Database software pre-installed on Oracle Cloud Virtual Machine. Database instances are created for you using configuration options provided in this wizard. 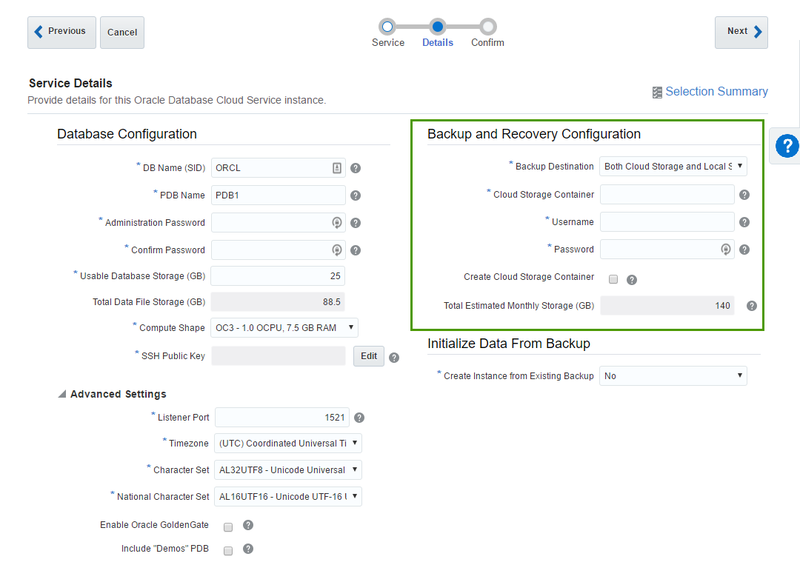 Additional cloud tooling is available for backup, recovery and patching. 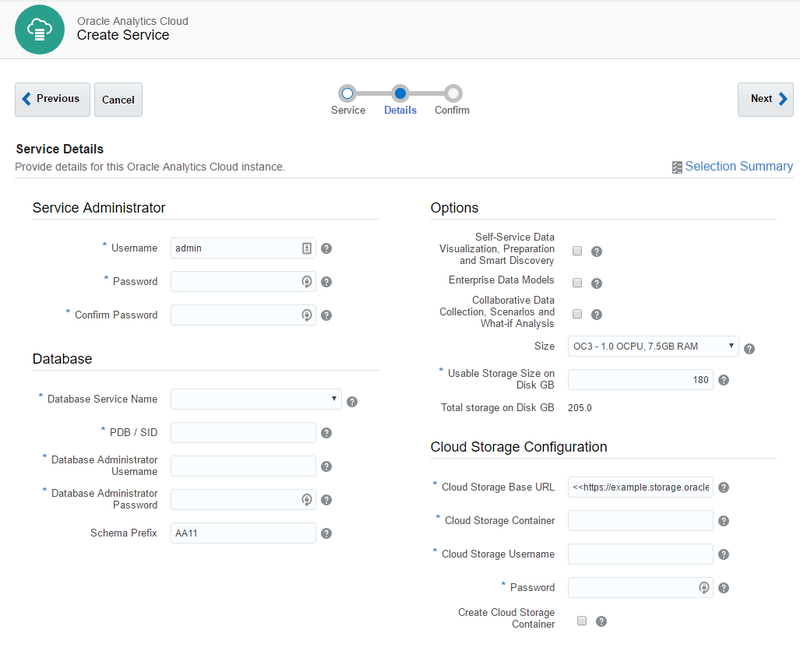 Oracle Database Cloud Service - Virtual Image: Oracle Database software pre-installed on an Oracle Cloud Virtual Machine. Database instances are created by you manually or using DBCA. No additional cloud tooling is available. Metering Frequency - defines how this instance will be paid: by months or by hours. Software Release - if the Service Level is Oracle Database Cloud Service, we may choose 11.2, 12.1 and 12.2, for Virtual Image only 11.2 and 12.1 are available. Note that even cloud does no magic and with DB 12.2 you may expect the same problems as on-premise. Database Clustering with RAC and Database Clustering with RAC and Data Gard Standby types are available only for Enterprise Edition - Extreme Performance edition. The second step is also quite intuitive. It has a lot of options but they should be pretty simple and well-known for anyone working with Oracle Database. 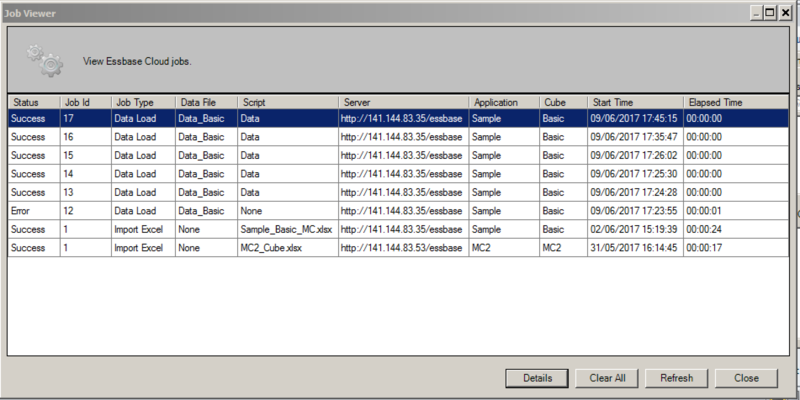 The first block of parameters is about basic database configuration. Parameters like DB name (sid) or Administration Password are obvious. Usable DataFile Storage (GB) is less obvious. Actually, in the beginning, it puzzled me completely. In this sample, I ask for 25 Gb of space. But this doesn't mean that my instance will take 25 Gb of my disk quota. In fact, this particular instance took 150 Gb of disk space. Here we specify only a guaranteed user disk space, but an instance needs some space for OS, and DB software, and temp, and swap, and so on. A trial account is limited with 500 Gb quota and that means that we can create only 3 Oracle DB Cloud instances at max. Every instance will use around 125 Gb of let's say "technical" disk space we can't reduce. From the practical point of view, it means that it may be preferable to have one "big" instance (in terms of the disk space) rather than multiple "small". We may increase or decrease this value later. SSH Public Key - Oracle gives us an ability to connect directly to the instance and authentication is made by user+private key pair. Here we specify a public key which will be added to the instance. Obviously, we should have a private key for this public one. Possible options are either we provide a key we generated by ourselves or let Oracle create keys for us. The most non-obvious thing here is what is the username for the SSH. You can't change it and it isn't shown anywhere in the interface (at least I haven't found it). But you can find it in the documentation and it is opc. The second block of parameters is about backup and restore. The meaning of these options is obvious, but exact values aren't (at least in the beginning). Cloud Storage Container - that's the Cloud Storage container I described earlier. Value for this field will be something like Storage-rurittmanm/demo. In fact, I may do not create this Container in advance. It's possible to specify any inexistent container here (but still in the form of Storage-<domain>/<name>) and tick Create Cloud Storage Container check-box. This will create a new container for us. 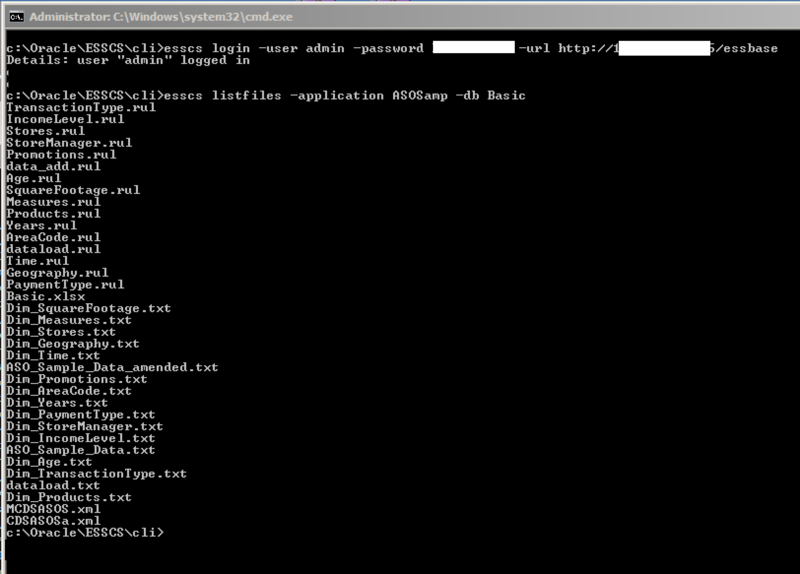 Username and Password are credentials of a user who can access this container. The last block is Advanced settings and I believe it's quite simple and obvious. Most of the time we don't need to change anything in this block. When we fill all parameters and press the Next button we get a Summary screen and the actual process starts. It takes about 25-30 minutes to finish. When I just started my experiments I was constantly getting a message saying that no sites available and my request may not be completed. It is possible that it was again the same "luck" as with the phone number verification but the problem solved by itself a few hours later. At last, we have all we need for our very first OAC instance. 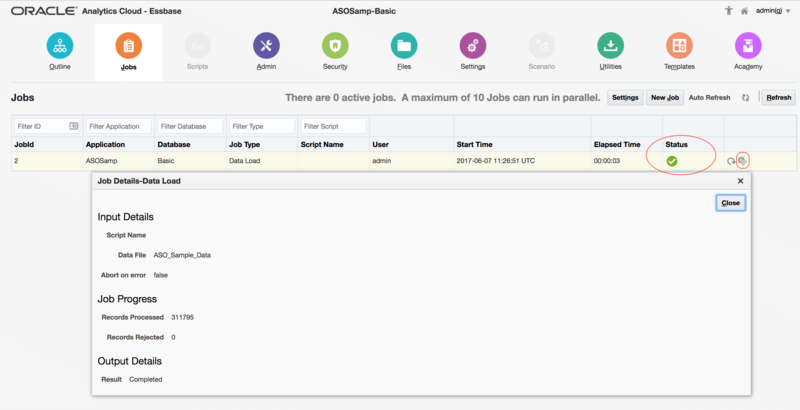 The process of an OAC instance setup is almost the same as for an Oracle DB Cloud Instance. We start the process, define some parameters and wait for the result. At the first step, we give a name to our instance, provide an SSH public key, and select an edition of our instance. We have two options here Enterprise Edition or Standard Edition and later we will select more additional options. Standard edition will allow us to specify either Data Visualisation or Essbase instances and Enterprise Edition adds to this list a classical Business Intelligence feature. The rest of the parameters here are exactly the same as for Database Instance. At the second step, we have four blocks of parameters. Service Administrator - the most obvious one. Here we specify an administrator user. This user will be a system administrator. 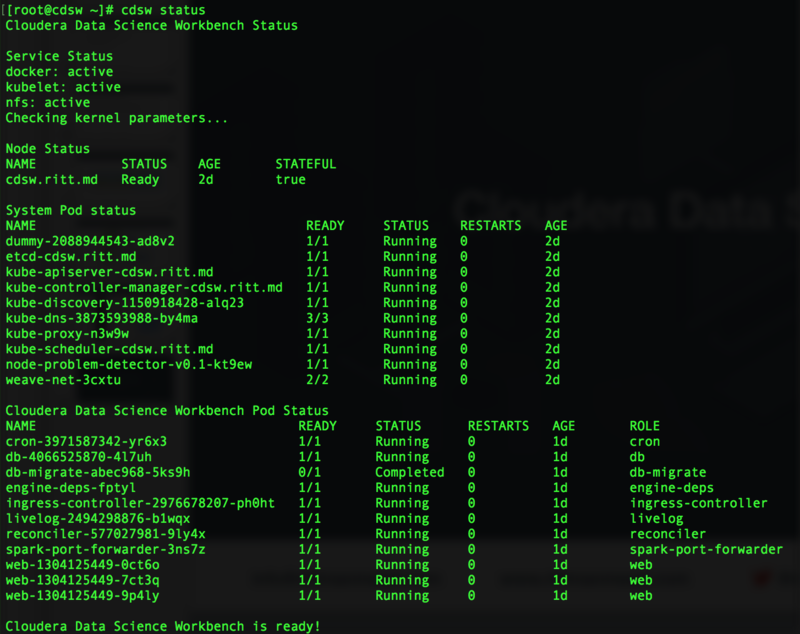 Database - select a database for RCU schemas. That's why we needed a database. 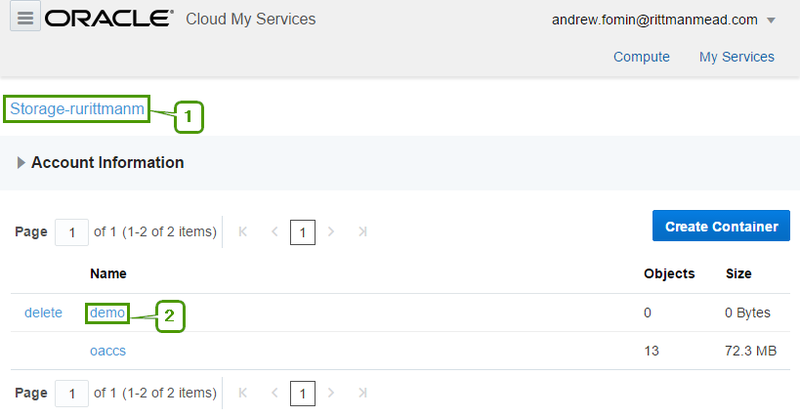 Options - specify which options our instance will have. Self-Service Data Visualisation, Preparation and Smart Discovery - this option means Oracle Data Visualisation and it is available for both Standard and Enterprise Editions. 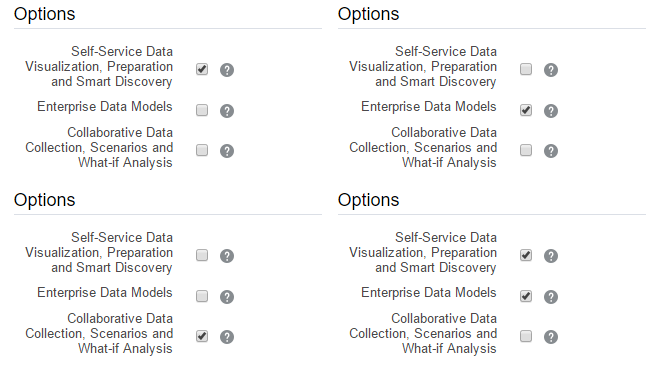 Enterprise Data Models - this option gives us classical BI and available only for Enterprise Edition. Also, this option may be combined with the first one giving us both classical BI and modern Data discovery on one instance. 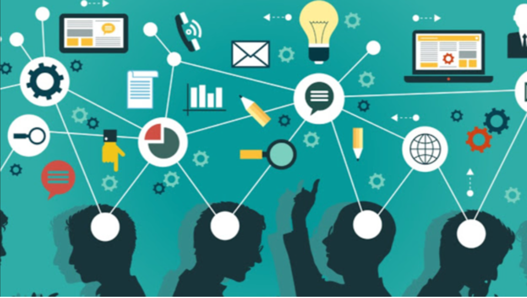 Collaborative Data Collection, Scenarios and What-if Analysis - this one stands for Essbase and available for Standard and Enterprise Editions. It can't be combined with other options. Size is the same thing that is called Compute Shape for the Database. Options are exactly the same. Usable Storage Size on Disk GB also has the same meaning as for the DB. The minimum size we may specify here is 25 Gb what gives us total 170 Gb of used disk space. And here virtual disks configuration. data disk is the one we specify. The last block - Cloud Storage Configuration was the hardest one. Especially the first field - Cloud Storage Base URL. The documentation says "Use the format: https://example.storage.oraclecloud.com/v1" and nothing more. When you know the answer it may be easy, but when I saw it for the first time it was hard. Should I place here any unique URL just like an identifier? Should it end with v1? And what is the value for the second instance? V2? Maybe I should place here the URL of my current datacenter (https://dbcs.emea.oraclecloud.com). 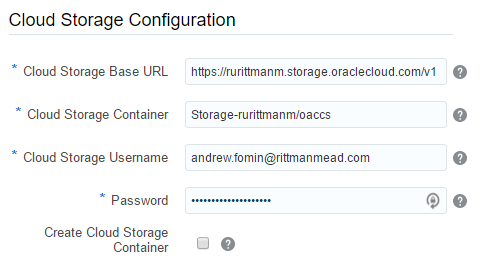 The answer is https://<domain>.storage.oraclecloud.com/v1 in my case it is https://rurittmanm.storage.oraclecloud.com/v1. It stays the same for all instances. All other parameters are the same as they were for DBCS instance. We either specify an existing Cloud Storage container or create it here. The rest of the process is obvious. We get a Summary and then wait. It takes about 40 minutes to create a new instance. Note: diagnostics here is a bit poor and when it says that the instance start process is completed it may not be true. Sometimes it makes sense to wait some time before starting to panic. Now we may access our instance as a usual. The only difference is that the port is 80 not 9502 (or 443 for SSL). For Data Visualisation the link is http(s)://<ip address>/va, for BIEE - http(s)://<ip address>/analytics and for Essbase http(s)://<ip address>/essbase. Enterprise Manager and Weblogic Server Console are availabale at port 7001 which is blocked by default. What is bad that https uses a self-signed certificate. Depending on browser settings it may give an error or even prevent access to https. 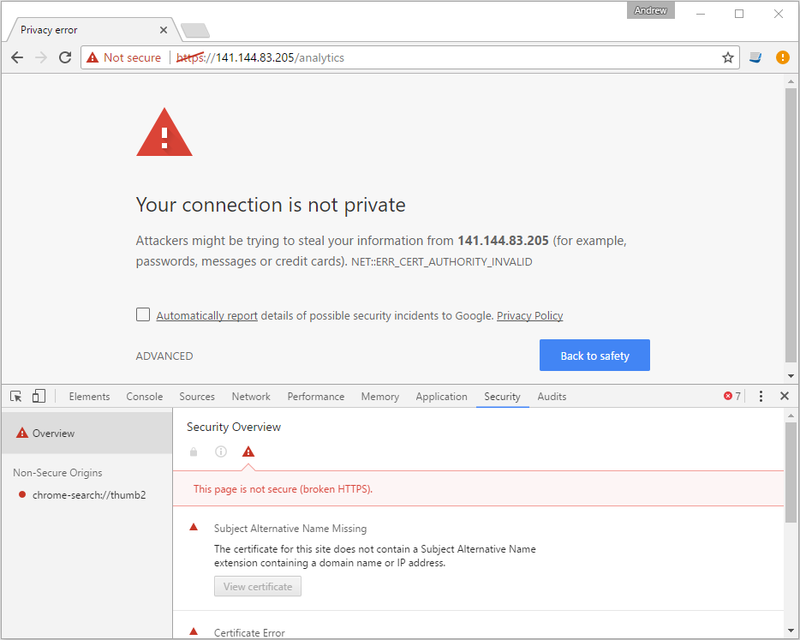 Options here either use HTTP rather than HTTPS or add this certificate to your local computer. But these aren't the options for a production server. Luckily Oracle provides a way to use own SSL certificates. During the setup process, we provide Oracle with a public key which is used to get an SSH access to instances. Cloud does nothing special to this. In the case of Windows, we may use Putty. 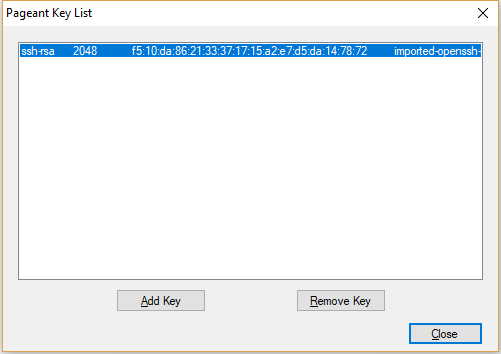 Just add the private key to Pageant and connect to the instance using user opc. 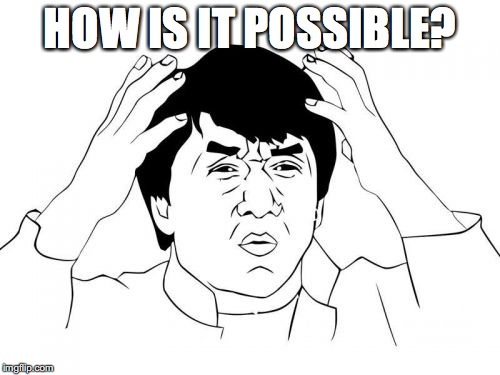 By default only the absolute minimum of the ports is open and we can't connect to the OAC instance using BI Admin tool or to the DB with SQLDeveloper. In order to do this, we should create an access rule which allows access to this particular ports. In order to get to the Access Rules interface, we must use instance menu and select the Access Rules option. This will open the Access Rules list. What I don't like about it is that it opens the full list of all rules but we can create only a rule for this particular instance. New rule creation form is simple and should cause no issues. But be careful here and not open too much for a wild Internet. The user who registered a Cloud Account becomes its administrator and can invite more users and manage privileges. Here we can add and modify users. When we add a user we specify a name, email and login. Also here we set roles for the user. The user will get an email with these details, and link to register. Obviously, the user won't be asked about a credit card. He just starts working and that's all. My first steps with Oracle Analytics Cloud were not very easy, but I think it was worth it. 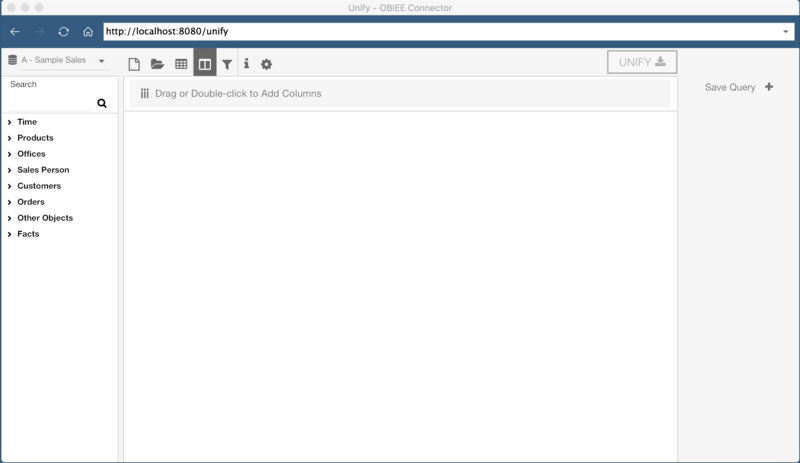 Now I can create a new OBIEE instance just in a few minutes and one hour later it will be up and running. And I think that's pretty fast compared to a normal process of creating a new server in a typical organisation. We don't need to think about OS installation, or licenses, or whatever else. Just try it. Today, I asked Oracle to move me from Oracle ACE Director status to Oracle ACE Alumni status. There are a number of reasons why I decided to change status. When I started answering questions on internet forums years ago, I did it to share what I had learned in order to help others. The same goes for this blog which I originally started so that I could give better and more complete answers to questions on the forums. After the Hyperion acquisition by Oracle, I was contacted by Oracle who asked if I would be interested in becoming an "Oracle ACE". It was an honor. But over time, things have changed. As more people found out about the ACE program, more people wanted to become an ACE. If you have ever monitored the OTN Essbase and Smart View forums, they have become cluttered with copy and paste posts from people obviously trying to increase their points. As the ACE program grew, it also become harder for the OTN team to manage and now require a formal activity reporting - a time report if you will - to track contributions to the community. As I am already extremely pressed for time, I decided that tracking my contributions to the community - in exchange for a free pass to Open World, just didn't make sense.